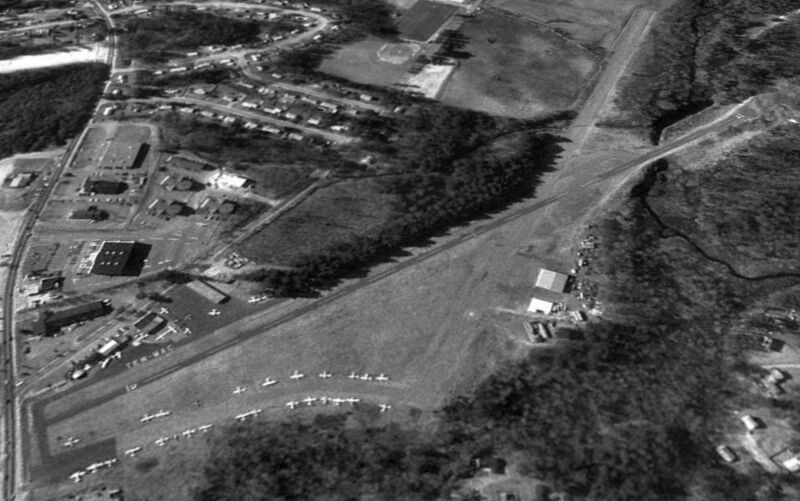 An April 1951 aerial view of Tew Mac Airport by Mark L. Thaisz of Col-East, Inc.
Arthur MacLaren applied in 1949 to the Board of Appeals for a permit to use his land to establish an airport. The permit was granted on 7/7/49. Two years of site preparation work then commenced. A Landing Area was authorized on 11/17/49, by the MA Aeronautic Commission. nor on the 1950 USGS topo map. The 20+ acre Tew-Mac Airport was recognized as an Official Airport on 3/26/51. The first manager was John Hanson. 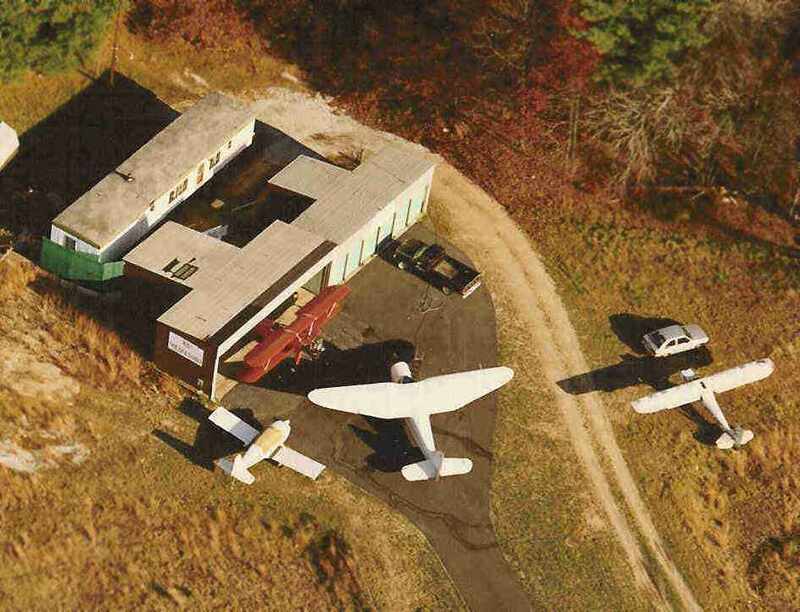 The earliest depiction of Tew-Mac Airport which has been located was an April 1951 aerial view by Mark L. Thaisz of Col-East, Inc.
with a single small building at the southwest corner, around which were parked 5 light single-engine planes. listed the Tewkesbury airport as having a single 1,850' turf Runway 3/21. It listed the manager as John Hanson, and the operator as Four Star Aviation. A Civil Air Patrol building was erected in 1952 & the first hangar was constructed in 1954. 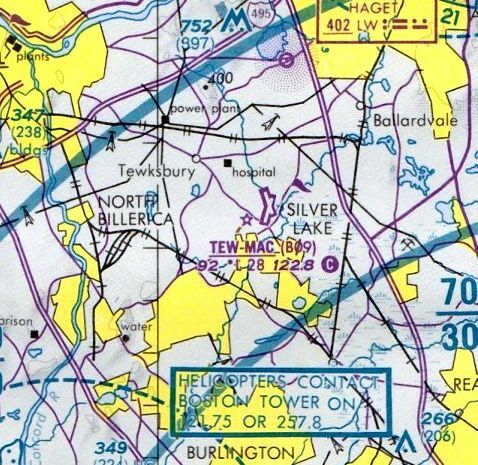 The earliest aeronautical chart depiction of Tew-Mac Airport which has been located was on the May 1953 Boston Sectional Chart. 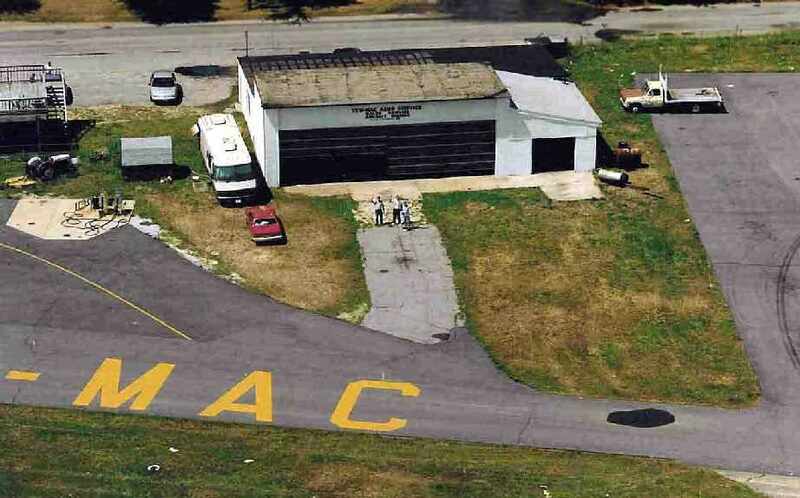 It depicted Tew-Mac as having a mere 1,800' unpaved runway. 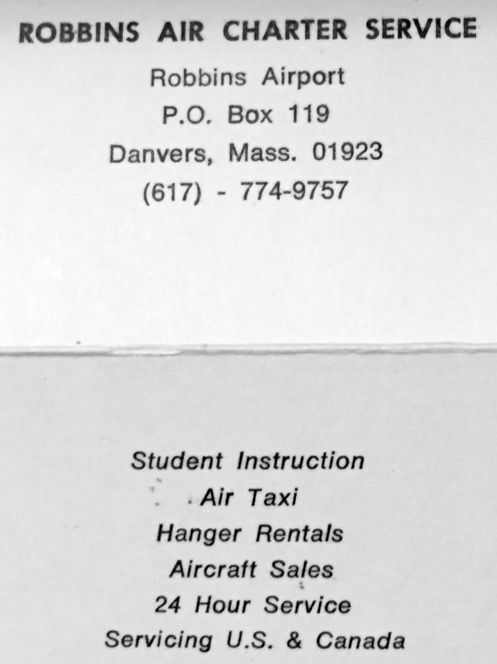 Gilbert Bergeron recalled, "I was taking flying lessons at Tew-Mac in 1954, receiving my private pilots license in 1956.
who moved their operation from the old Billerica-Wilmington Airport. The operation was called Four Star Aviation Inc.
with powerlines running across the approach end of Runway 3, along Route 38." Clifford Hupper purchased the Tew-Mac Airport in 1959 & became its Manager. An expansion program included lengthening the runway & adding lights. after the crash & death of Ed Zimmney, who had a flight school at the southern end of the field. Ed, I believe, was flying Ted Kennedy around Massachusetts on campaign trips when he was running for the Senate. The crash put Kennedy in the hospital for a long period of time with a broken back. At that time, Tew-Mac was taken over by Clifford Hupper (Warren's father). and lived in a house at the southeastern corner of the field near Route 38)." The 1960 Boston Local Aeronautical Chart (courtesy of Mike Keefe) described Tew Mac as having a single 1,850' turf runway. and let me drive around the runways sitting on his lap. I was 5 or 6 at the time. He & his wife Ora Maclaren lived in a house on the southeast corner. Grandpa sold the house & it was moved to another location. and would ride my bike down to the Airport & spend all my free time there between 1962-66. I use to fly with a lot of the pilots who owned planes there. On weekends I use to fly with Art Moran, who at the time owned a converted 1938 Piper J-2. The engine was changed from a 40 HP to a 60 or 65 HP engine & ran great. We would often takeoff to Plum Island, Norwood, Nashua Airports or just out for a weekend ride." used to give me a job picking up papers or other things & would give me a ride in his Piper J-8 Cruiser or one of the J-3s. One morning in the summer, I was riding with one of the other pilots in his Cessna 172 Skyhawk & on final approach the engine stopped. Luckily, he was a very skilled pilot & landed 'Dead Stick'. Something I will always remember is a man who use to visit the Airport to show off his special plane. Instead of flying down the runway he would fly across the field & take off over the trees." and had the tow bar still on the nosewheel as he was getting ready to crank the engine. I ran out to the field with my hands waving & yelling 'Stop!' He saw me & did not start the engine. To reward me he gave me a nice ride & showed me how Omni worked. that Cliff Hupper kept in the office saying that I could fly with any qualified pilot. and Toby Pierson who had his student pilot's license before he got his drivers license." the gentlemen who ran the Aviation Maintenance shop. It was fun watching them work on the planes & learn all about aerodynamics as well as how the various tools worked. As a visitor, I was always treated like one of the family & had free reign over the whole field. and on a hot day he would buy me a Coke out of one of the machines in the office. Art 'Red' McLaren & his family were also friends of mine. He owned the land that the Airport was built on." 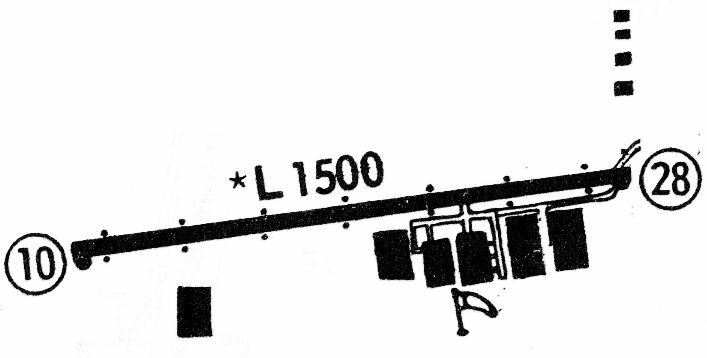 The 1962 AOPA Airport Directory described Tew-Mac as having a single 1,950' sod runway. 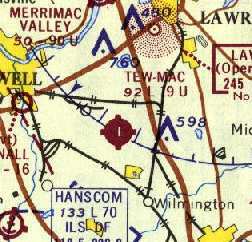 Tew-Mac was depicted on the 1963 Boston Sectional Chart (according to Chris Kennedy) as having an 1,850' turf runway. A circa 1960s photo of Tew-Mac Airport depicted a row of light single-engine planes next to a few small buildings & a grass airfield. a Tew-Mac runway was paved in 1964.
and over a dozen light aircraft clustered around both sides of the south end of the runway. The 1965 USGS topo map depicted Tew-Mac Airport as having a paved northeast/southwest runway, a parallel taxiway, and 3 small buildings on the southwest side. 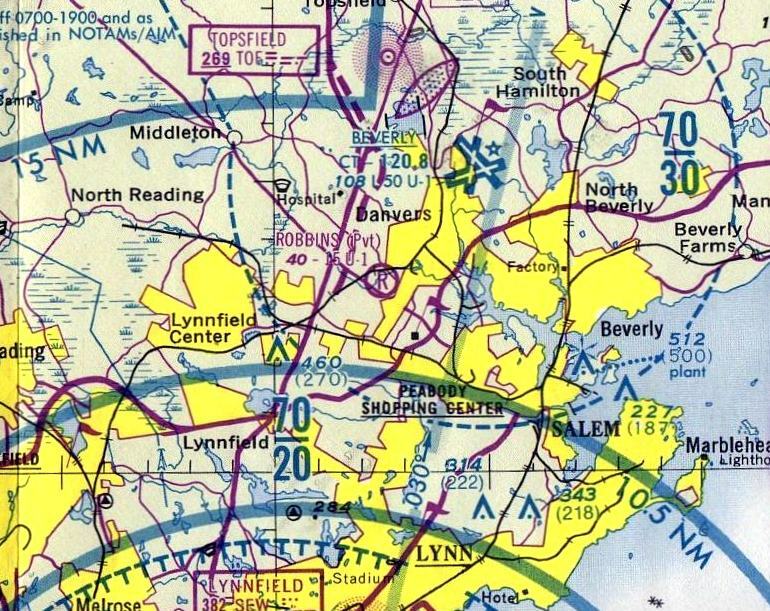 The Aerodromes table on the 1965 Boston Sectional Chart (courtesy of John Voss) described Tew-Mac as having a single 1,964' asphalt runway. as having a single 1,960' paved Runway 3/21, with a parallel taxiway & 3 small buildings on the southwest side. 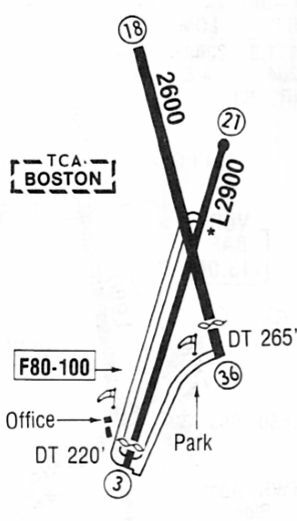 The 1968 Boston Sectional Chart (courtesy of Mike Keefe) depicted Tew-Mac as having a single 1,900' paved runway. as a 1971 aerial view depicted Tew-Mac as having 2 paved runways. Over 25 light aircraft were visible on the south side of the field. as having 2 paved runways, of 2,900' & 2,603'. 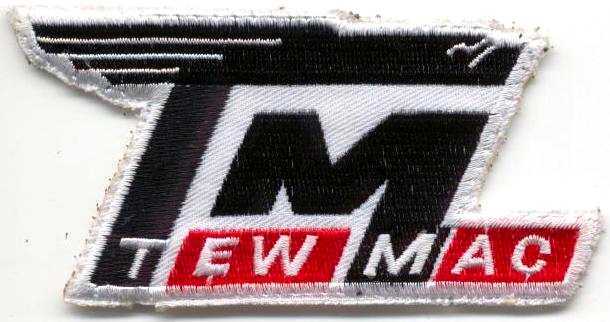 A patch from the Civil Air Patrol's Tew Mac Composite Squadron. Joseph Toto recalled, “I was 15 when I used to ride my bike from Wilmington to Tewksbury to take flying lessons. I loved those days. I was friends with Cliff Hupper (grandson) & went to high school with him as well. who occasionally gave me rides home (with my bike in his trunk). just being at Tew-Mac was an experience I have yet to duplicate anywhere else I fly. depicted Tew-Mac as having 2 paved runways, with the longest being 2,800'. 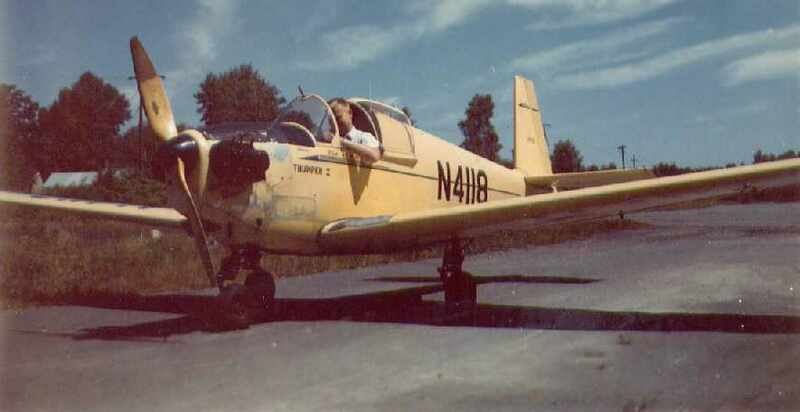 T. Riley recalled, “Tew Mac was where I got my single-engine VFR pilots license back in 1975 or 1976. I remember coming in over the miniature golf course - the rocket was pretty high coming in for a landing. I remember my first solo there & what a fantastic feeling it was. I was 22 or 23. Steven Whitcomb recalled, “My first flight was in 1976 at Tew-Mac airfield. with several dozen light aircraft visible on the southwest & southeast sides of the field. The November 1983 Flight Guide (courtesy of Matt Elia) depicted Tew-Mac as having 2 paved runways, with an office & another small building on the southwest side. by John Ford of Les Vants Aerial Photos. A 1991 aerial photo of Tew-Mac Airport from 12,500', by John Ford of Les Vants Aerial Photos. It depicted Tew-Mac as having 2 paved runways, with the longest being 2,800'. 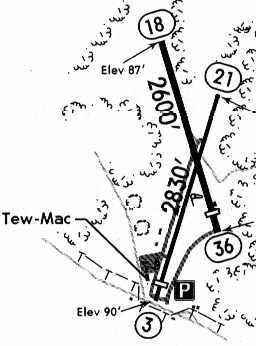 The 1993 Jeppesen Airport Directory depicted Tew-Mac as having 2 paved runways: 2,830' Runway 3/21 & 2,600' Runway 18/36. The operator was listed as Tew-Mac Aviation, Inc. 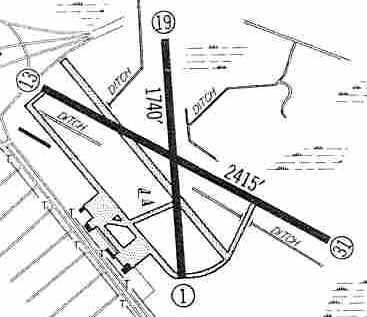 The 1994 Jeppesen Airport Directory depicted Tew-Mac as having 2 paved runways: 2,830' Runway 3/21 & 2,600' Runway 18/36. A 1995 USGS aerial view looking northwest showed Tew-Mac Airport to be very well-used, with over 40 single-engine aircraft visible. A beautiful 1996 aerial view by John Ford of Les Vants Aerial Photos of Tew-Mac Airport, the year before it closed..
A total of 35 light aircraft were visible parked outside. A 1997 aerial view by John Ford of Les Vants Aerial Photos of Tew-Mac Aero Service hangar, in the airport's last year. and the last to take off (the airport owner, Warren Hupper's, Grumman Cougar). Tew-Mac Airport was closed in 1997. A sad sight: a 1998 aerial view by John Ford of Les Vants Aerial Photos of the site of Tew-Mac Airport only one year after its closure. 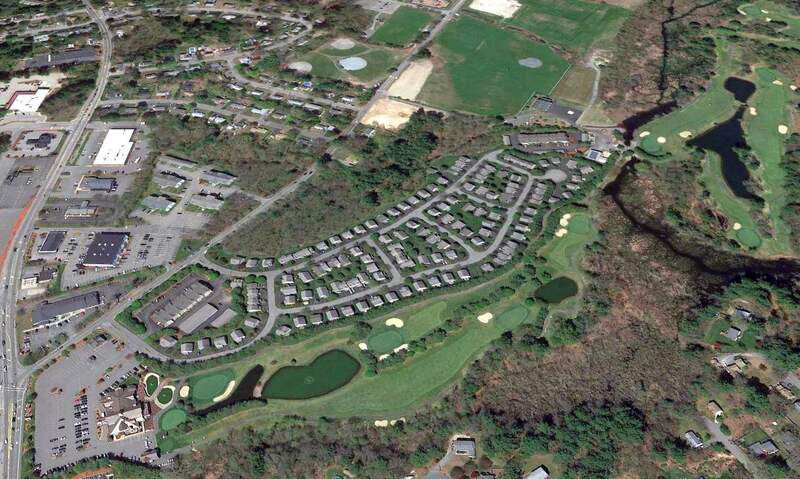 Nearly all traces of the airport had been removed, as the site was covered with a retirement community & golf course. The only remaining trace of the former airport was a short section of the north end of the former crosswind runway (top-left of photo) which still remained untouched. A 2016 aerial view looking northwest shows the site of Tew-Mac Airport as being unrecognizable as a former airport. Just what we need: more houses. Gilbert Bergeron observed, "I've shed a tear or two to see the field torn up as I have many wonderful memories of flying there in Cubs & Champs." Thanks to Charlie for pointing out this airfield. An undated photo of a pilot (Harry Atwood?) at Atwood Park (courtesy of Sandy Muise). According to Wikipedia, a one-mile oval horse racing track named Franklin Park was operated at this location from 1859-1905. “The idea of building an aviation field on the site of the Old Saugus Race Track was first proposed in December 1910 by the Aeroplane Company of America. The company proposed spending $100,000 to convert the old race track into an airfield & construct a factory for the manufacturing of flying machines. The company also planned to maintain a flight school & hold aviation meets on the site. keep the roads leading to the field in good condition, and be lenient in the tax assessment of the improved property. there was sufficient room for the construction of new buildings, and the atmospheric conditions were ideal for flying. The Wikipedia article continued, “On 12/21/1911 Harry Atwood claimed to break the record for longest time in the air in a hydroaeroplane by remaining in the air for 80 minutes. On 5/30/12-6/1/12 Atwood Park hosted an aviation meet that was attended by some of the biggest aviators in the country, including Atwood, Lincoln Beachey, Philip W. Page, and Arch Freeman. 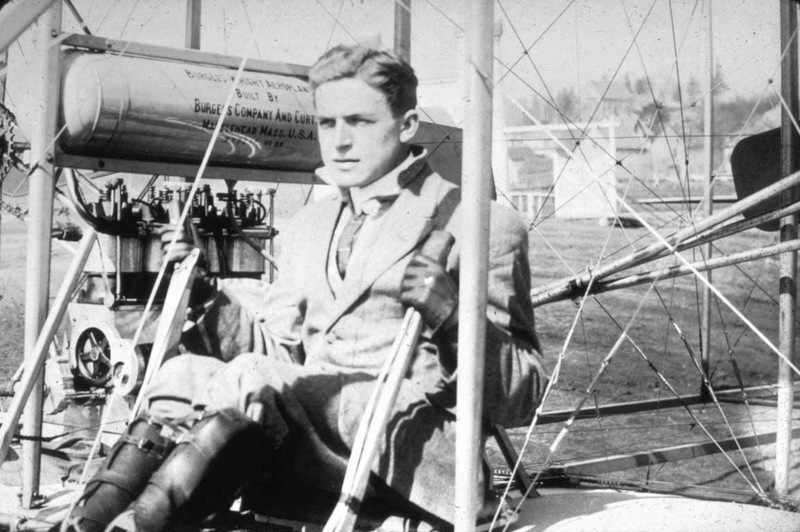 On the first day of the meet, Atwood made the first airmail delivery in New England. He flew about 5 miles to the Lynn, MA Town Commons where he dropped a sack of mail from the plane. The sack was then retrieved by a Lynn postal employee & driven to the Post Office. dropped 150 feet, crashed into a pole, turned upside-down, and fell to the ground. Fish was able to extract himself from the plane, but then fell headlong into a ditch filled with water. Morris Shoemanhorne, Fish's student, was also able to remove himself from the wreck. The two were then assisted by mechanics who had been working in the hangar. Fish suffered only minor injuries while Shoemanhorne had a bruised head & a badly twisted right ankle. The Wikipedia article continued, “In 1912, the property was purchased by the General Aviation Corporation who named it Atwood Park in honor of pilot Harry Atwood. 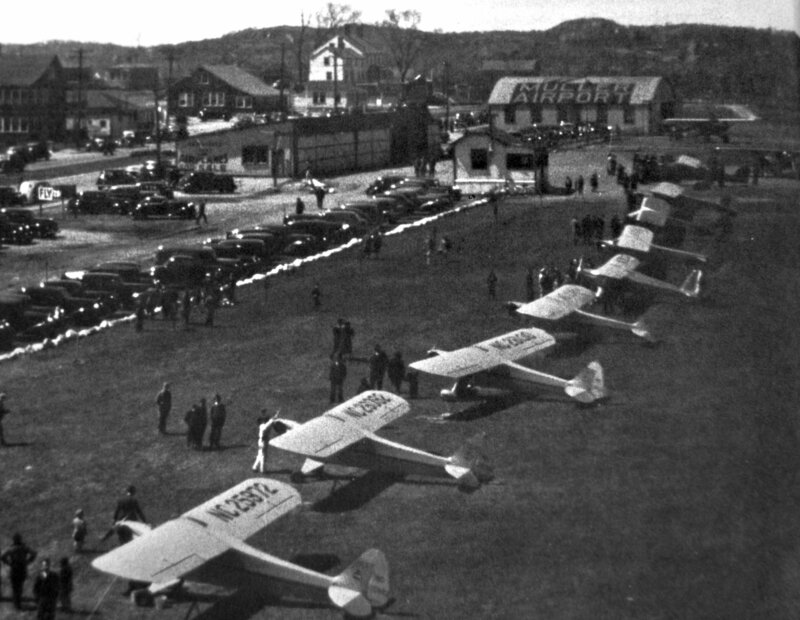 Atwood Park was home to one of the busiest aviation schools in the country. In 1912 the school had 43 students, more than any other aviation school in the U.S. The school used a Burgess–Wright Model B for instruction. Atwood was the school's chief instructor, but assistant instructor Arch Freeman did most of the flying. Ripley Bowman also instructed at the school. Atwood quit on 6/10/12. The reasons given for his departure were that he could make more money in exhibition flights & he had become disenchanted with Freeman. Atwood took the school's only plane with him & as a result, the school closed. had received enough training that they were able to fly their own planes solo. Waite established a new school at the aviation field that remained open until early 1913. The Wikipedia article continued, “On 10/21/1915, Chauncy Redding & Philip Bulman were killed when their plane crashed about a third of a mile from the airfield. 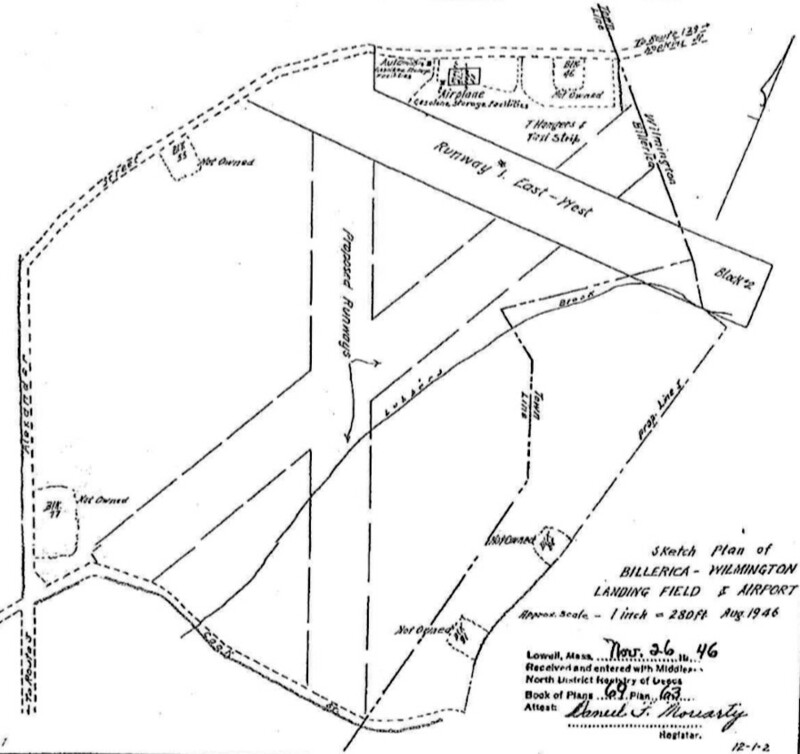 The 1918 USGS topo map depicted the oval racetrack, but did not label the property as an airfield. The 1925 USGS topo map continued to depict the oval racetrack, but did not label the property as an airfield. According to Wikipedia, “The airfield remained in use until 1927. Saugus Field was not depicted on the March 1933 Boston Sectional Chart. led by Henry Peckham, John Mullen, Charles Friend, Harold Dodge, Frederick Willis, William Landergan, and James McElroy attempted to bring horse racing back to the site. Mullen even arranged a meeting with his friend Governor Joseph Ely in an attempt to get his assistance. 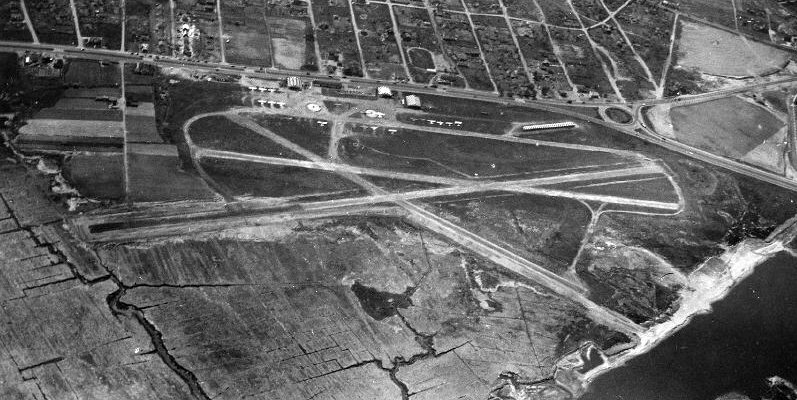 A 1938 USGS aerial photo depicted the remains of the oval racetrack, but did not show any recognizable trace of an airfield. According to Wikipedia, “In 1940, property owner Godfrey Cabot offered the site to the U.S. Navy for use as the location of its main New England dirigible base. In 1948 he donated the land to Northeastern University. In 1950 a proposal was made to construct a $5 million gasoline storage plant on the site. 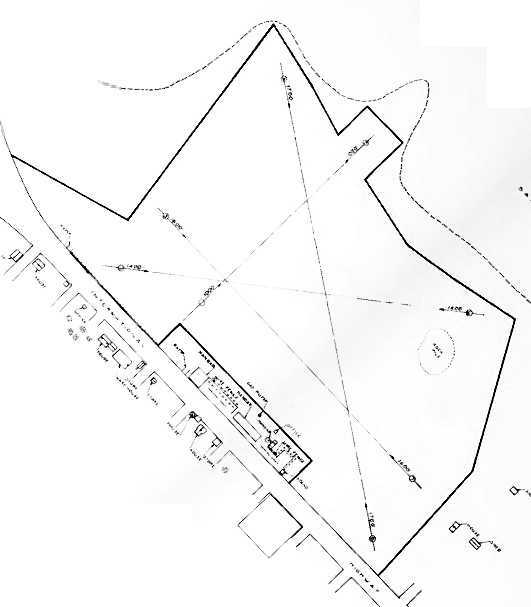 In 1970 developer George Page & property owner Martin DeMatteo presented the Board of Selectmen with a plan to build a 60,000 seat stadium on the property. and it was abandoned when the Boston Patriots chose Foxborough, MA as the location of their new stadium. A circa 2010-2016 aerial view looking north at the remains of the oval racetrack of Franklin Park, within which was presumably the airfield of Saugus Field. A 2016 aerial view looking northwest at the remains of the oval racetrack of Franklin Park, within which was presumably the airfield of Saugus Field. The site of Saugus Field is is located south of the southwestern terminus of Saugus Avenue, appropriately enough. Thanks to Sandy Muise for pointing out this airfield. 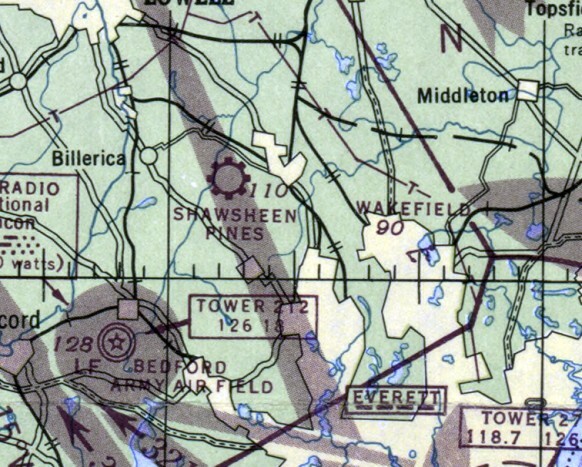 Shawsheen Pines Airport, as depicted on the July 1946 Boston Sectional Chart. who built a small airstrip in a field on Hopkins Street, at the Wilmington - Billerica town line. There was a hangar & a few J3 Piper Cubs. Before long, auto dealer Fred Cain offered to go into a partnership with Todman. Cain was then the 2nd-largest dealer for International Harvester trucks in New England. The article continued, “Cain then went to Texas, where he bought 3 AT-6 trainers & 2 twin-engine Cessnas. He had them refurbished & flown to the little airport. 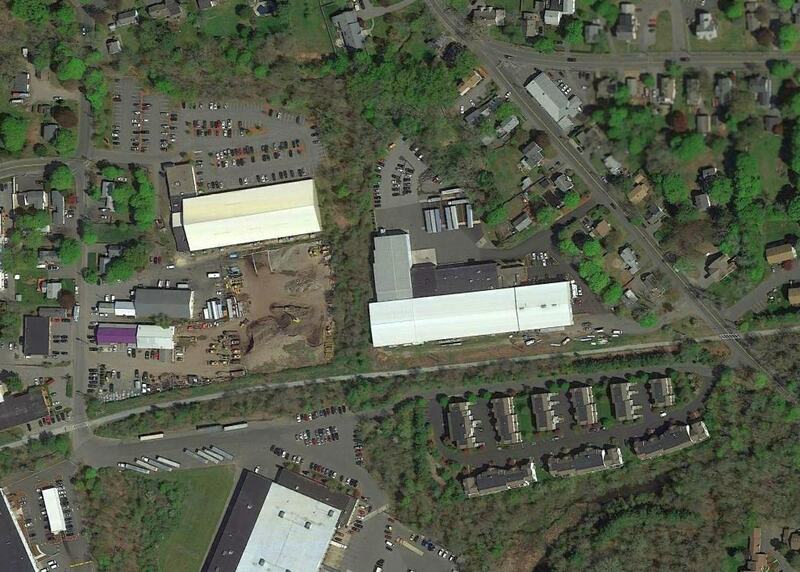 The airport had 2 hangars, Quonset hut buildings, next to Hopkins Street. Cain brought in a flight instructor, John Hanson, and a mechanic, Larry Teed, who started a flight school. Things went well until Todman allowed someone to take up a plane after only one lesson, after being told specifically not to do that. The plane, an AT-6, only had one hour on it since being rebuilt. The flight went well, except for the landing, when the plane hit a stone wall. Frustrated with the lack of cooperation, Cain said he wanted to get out. 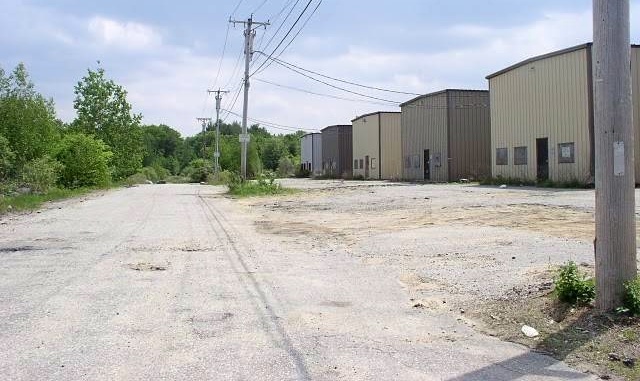 Hanson & Teed bought land in Tewksbury & established the Tew-Mac Airport. Chuck Mason recalled, “It was opened in 1945 & I soloed there in October that year with Russ Todman as my instructor. By the way, I set a record there that to my knowledge was never broken - I soloed in 4:20. Johnny Hanson gave me my private check ride in April 1946. I earned flying time at the airport as a line boy, 1 hour of solo time for 8 hours of work. Frank Teed was the main mechanic there. and did anything else around the airport to earn flying time which was $8/hour wet in a Piper J-3 Cub. The earliest aeronautical chart depiction which has been located of this airport was on the July 1946 Boston Sectional Chart. 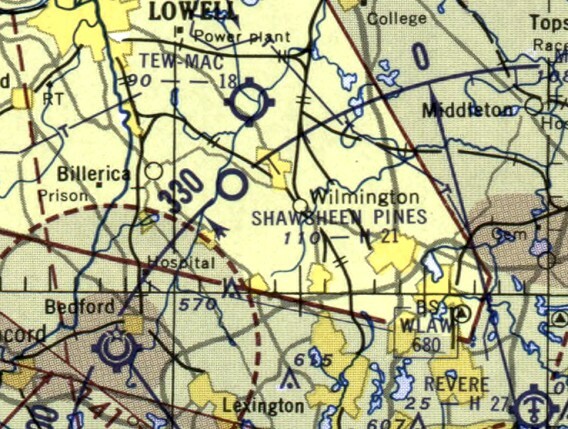 It depicted “Shawsheen Pines” as a commercial/municipal airport. 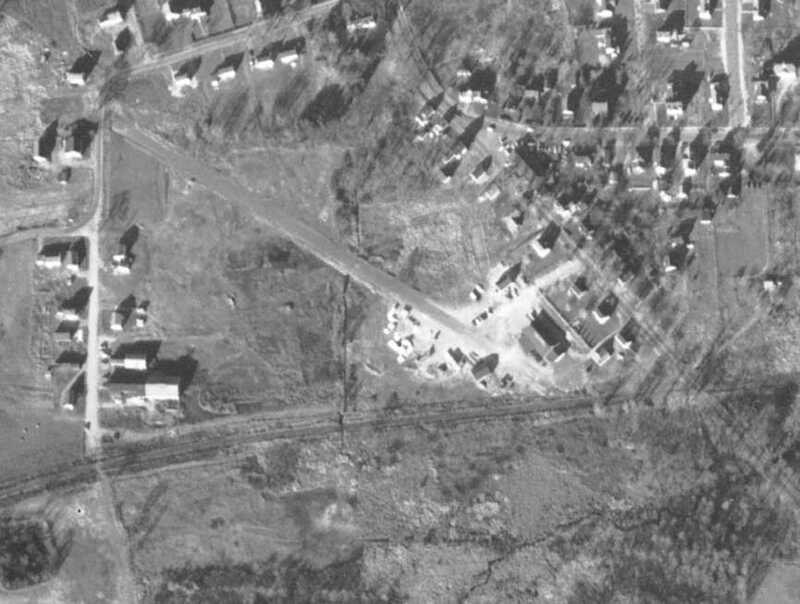 The earliest photo which has been located of Billerica Airport was a July 1946 aerial view looking east. It depicted an unpaved east/west runway. An August 1946 plan of the Billerica-Wilmington Airport from the Middlesex North Registry of Deeds (courtesy of Paul Chalifour). with a hangar on the north side of the single east/west runway, but also with 2 planned (but never-built) runways to the southwest. Bob Bunton recalled, “Billerica/Wilmington, circa 1946, they had a bustling business with about 10 Cubs & many other types including UC-78s. 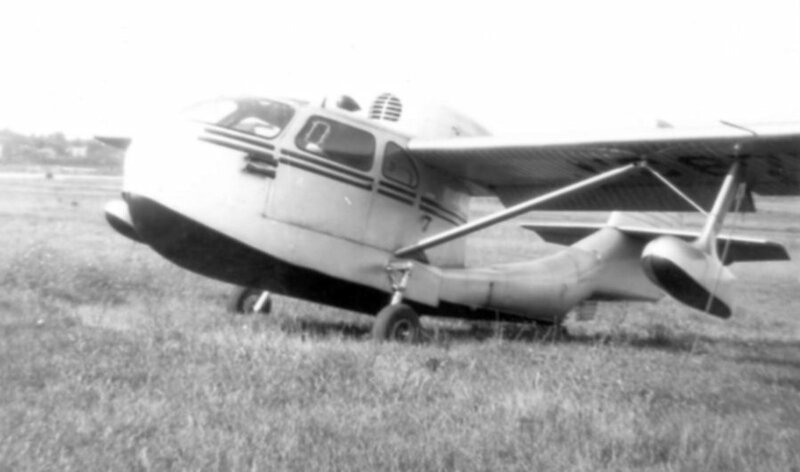 John Collins recalled, “I remember seeing a sign on a hangar saying 'Authorized Cessna Service'. I also remember an arrow on the roof of a veteran's organization building, near the Wilmington town green, pointing to this airport. 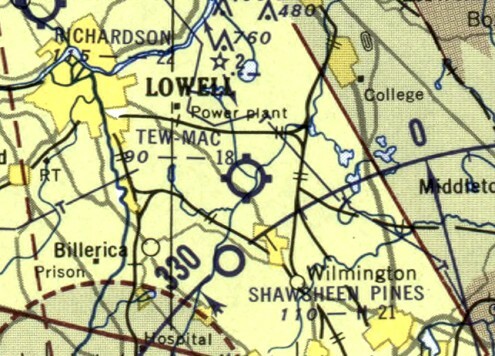 The 1949 Boston Local Aeronautical Chart depicted Shawsheen Pines Airport as having a 2,200' paved runway. 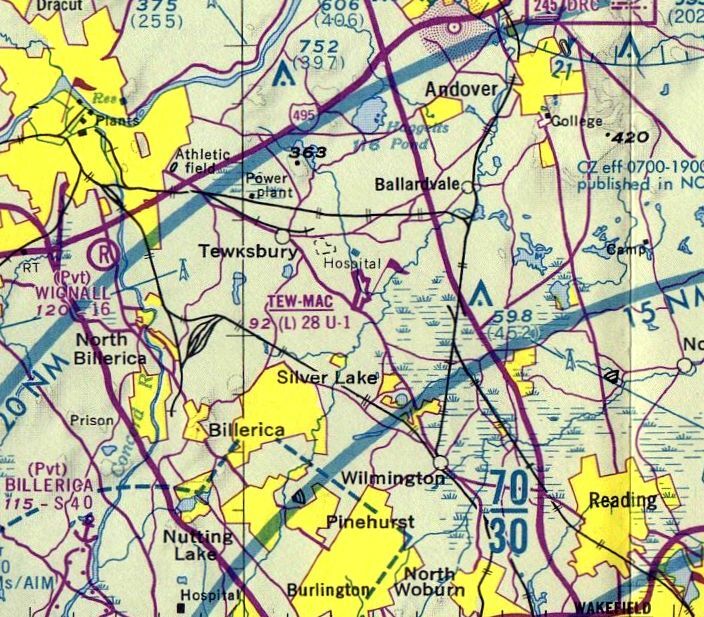 The 1950 USGS topo map depicted a clearing & 2 buildings at the location of Billerica-Wilmington Airport, but did not label the airport. a dozen T-hangars, and several light planes on the side of an unpaved runway. showing a biplane sans wings, a Cessna T-50, and a Fairchild PT-26. was on the May 1953 Boston Sectional Chart. 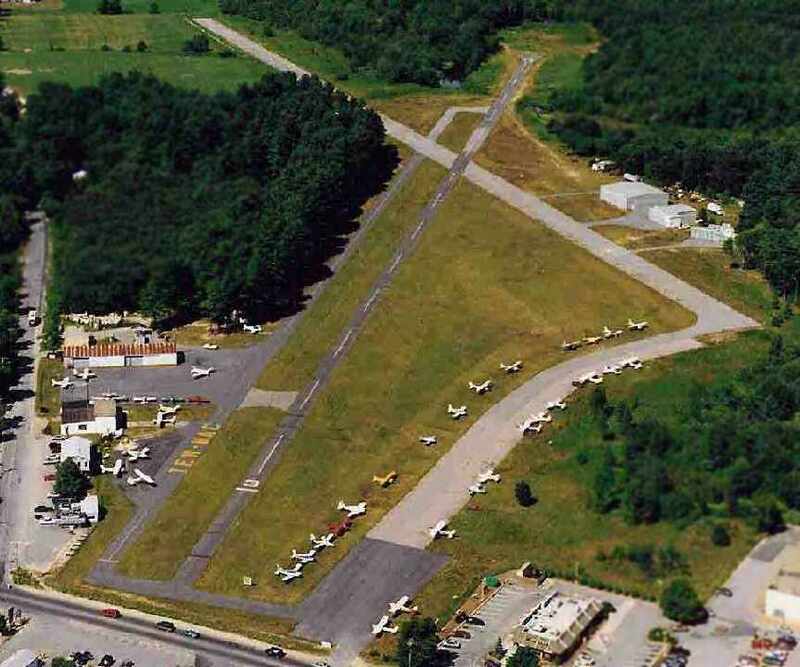 It depicted Shawsheen Pines Airport as having a 2,100' paved runway. because it was no longer depicted on the May 1955 Boston Sectional Chart. 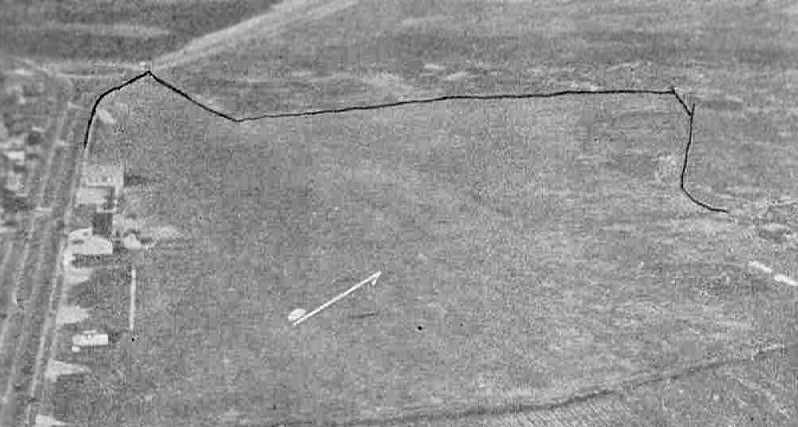 as a 4/28/63 USGS aerial photo showed the field still remaining intact, but seemingly abandoned. with the crosswind runway evidently having been abandoned. According to Paul Chalifour, “My first recollection is from 1968-69. I lived about a mile away & often drove by it with my parents. 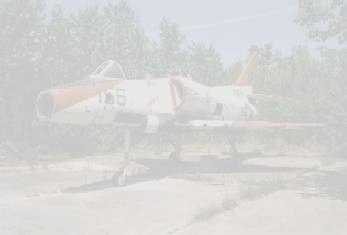 I remember hiking through the woods from my childhood home about a mile or so away to play in the abandoned hangars. (all that is left are partial pieces of their slab foundations). 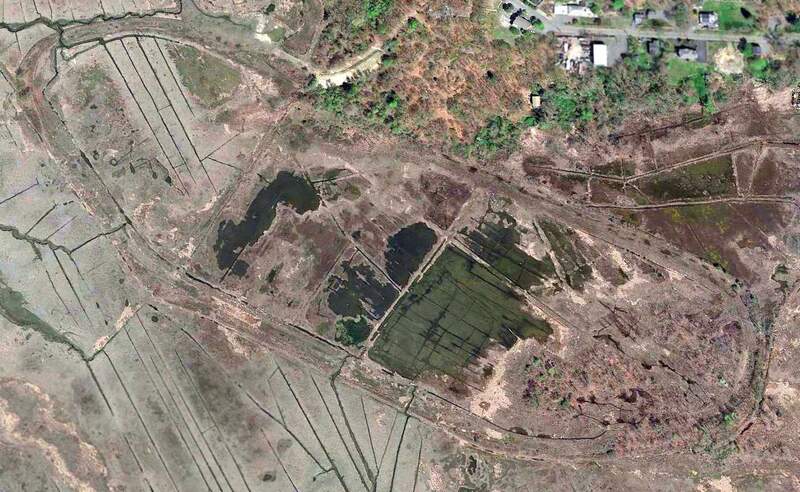 A 1971 aerial view showed that the Billerica-Wilmington hangars still remained standing, and the runway remained intact, though deteriorated. no longer depicted Billerica-Wilmington Airport. but their foundations remained recognizable. The area of the runway remained clear. A 1995 aerial view showed that a large industrial building had been constructed over the site of the hangars. The majority of the runway area remained clear, but was no longer recognizable as such. 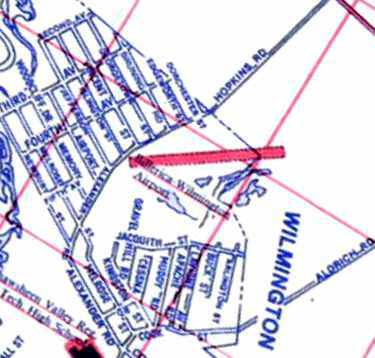 A 2000 street map annotated to show the location of the Billerica-Wilmington Airport runway (courtesy of Robert Atkinson). 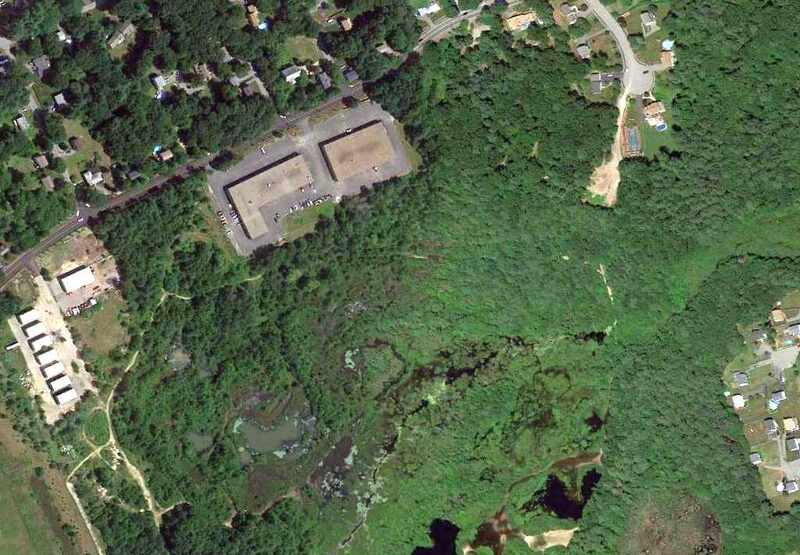 A 6/18/10 aerial photo showed the faintest trace of the former east/west runway in the woods at the site of Billerica-Wilmington Airport. 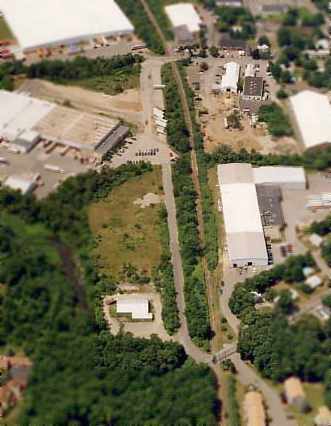 A 2000 photo by John Collins of the site of Billerica-Wilmington Airport. Paul Chalifour reported in 2013, “The hangars, house (office), runway, and plane shelters are all gone. However, the large farmhouse above the hangars still stands. It's on the corner of Dorchester Street & Alexander Road. The site of Billerica-Wilgmington Airport is located northeast of the intersection of Alexander Street & Cessna Road, appropriately enough. 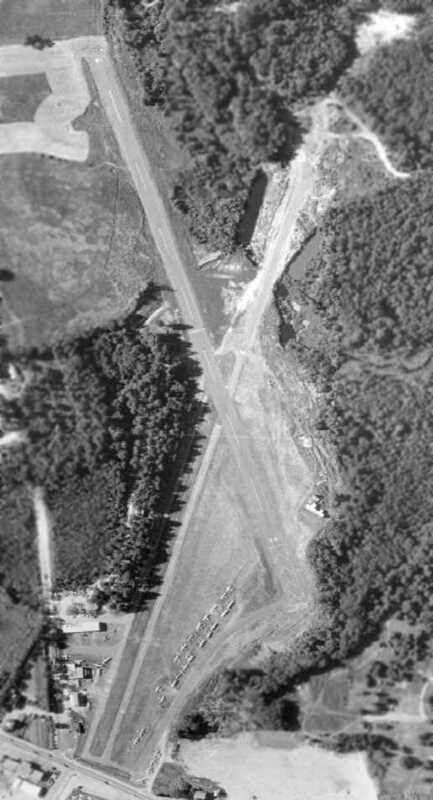 A 12/1/55 USGS aerial photo of Robbins Airport. The earliest depiction which has been located of Robbins Airport was a 12/1/55 USGS aerial view. It depicted a single very short unpaved northwest/southeast runway, with some buildings on the southeast side. The 1956 USGS topo map depicted Robbins Airport as having a single northwest/southeast runway with several buildings, but did not label the airport. 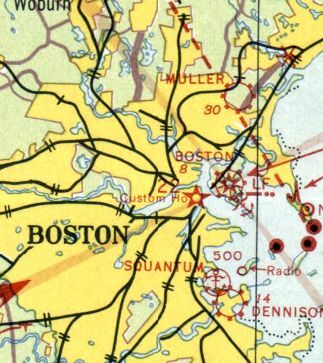 However, Robbins Airport was not yet depicted at all on the June 1959 Boston Local Aeronautical Chart (according to Chris Kennedy). The earliest aeronautical chart depiction of Robbins Airport which has been located was on the November 1959 Boston Sectional Chart. 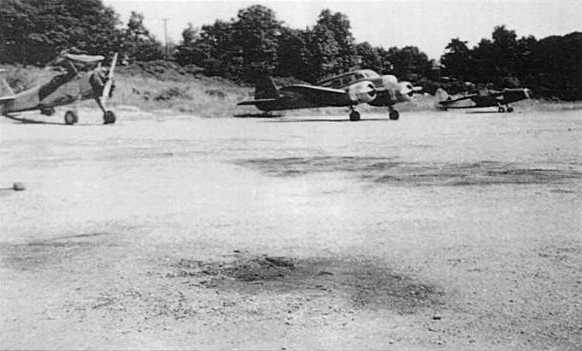 It depicted Robbins as a private field having a mere 1,300' runway. having a 1,400' paved Runway 13/31 & a 1,500' sod Runway 9/27. Robbins was described in the same manner in the 1963 AOPA Airport Directory (courtesy of Chris Kennedy). David Savage recalled, “I did a little flying out of Robbins Field. It was a private field & before Earle Robbins would let you fly into it, you had to drive in & get checked out by him or one of his instructors. He threatened to have anyone arrested for trespassing if they did not follow his rules. who was also the only flight instructor & also owned an adjoining lumber yard. described Robbins as a private field with a single 1,461' bituminous runway. as the 1967 AOPA Airport Directory (courtesy of Chris Kennedy) gave no indication of the field being private. The field had a single 1,500' bituminous-concrete Runway 10/28. and the field was listed as offering fuel, minor repairs, hangars, tie-downs, and charter. with 5 large hangars on the southeast side, and 4 smaller buildings on the northeast side. in a single-seat Mooney Mite (“Thumper 1”) on the runway at Robbins. 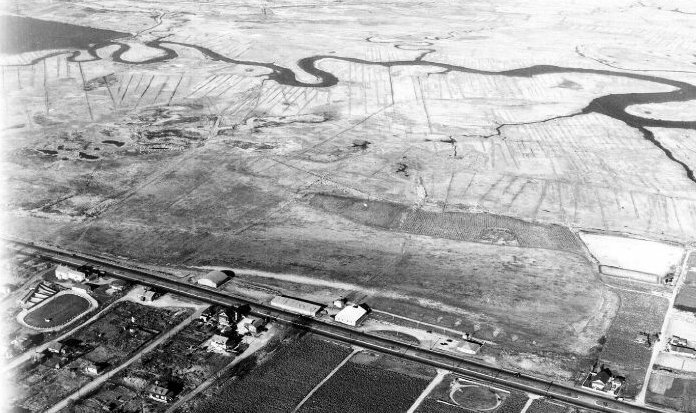 A 1969 aerial view showed that Robbins had a single east/west paved runway. The former northeast/southwest runway was still visible, but appeared to be abandoned. Several hangars were on the south side, along with 9 light aircraft. Scott Traill recalled, “My Dad [Dusty Traill] flew out of Robbins Airfield on a regular basis during the 1960s & early 1970s. that was towed behind the plane over Fenway in Boston & surrounding areas at night. 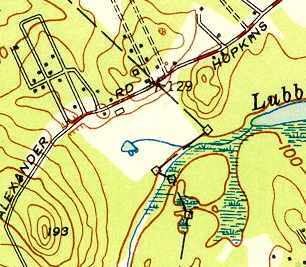 The 1970 USGS topo map depicted Robbins as having a single east/west paved runway, labeled simply as “Landing Strip”. 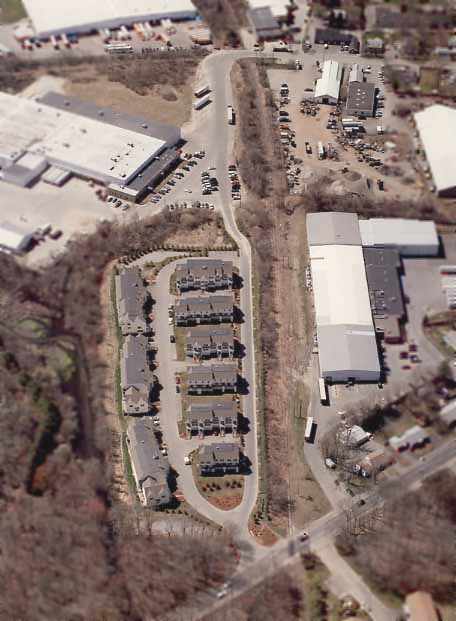 The former northwest/southeast runway on the opposite side of the railroad tracks was depicted as having become a street. 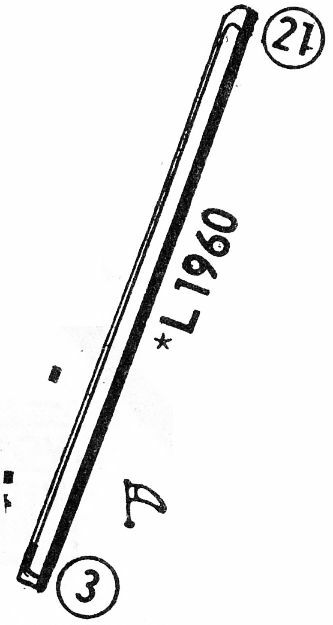 as that is how it was depicted on the January 1971 NY Sectional Chart (courtesy of Chris Kennedy). A 1971 aerial view depicted Robbins Airport as having a single paved east/west runway. and 2 light aircraft were visible parked outside. An undated (circa 1970s?) photo of 4 Pipers & the Robbins Airport sign (courtesy of Earlene Robbins Goodwin). An undated (circa 1970s?) business card for Robbins Air Charter Service (courtesy of Earlene Robbins Goodwin). A 1972 aerial view looking southwest at Robbins Airport by John Barnes (courtesy of Brian Barnes). The airport office was visible at left, with another 5 hangar buildings on the south side of the runway. A single aircraft was visible parked outside. showing 3 Pipers parked on outside. and remember Robbins Airport, located just off the end of our westbound runway. and do remember an occasional arrival & departure down there too. was on the June 1975 Boston Terminal Aeronautical Chart (courtesy of Mitchell Hymowitz). It depicted Robbins as a private field having a 1,500' unpaved runway. 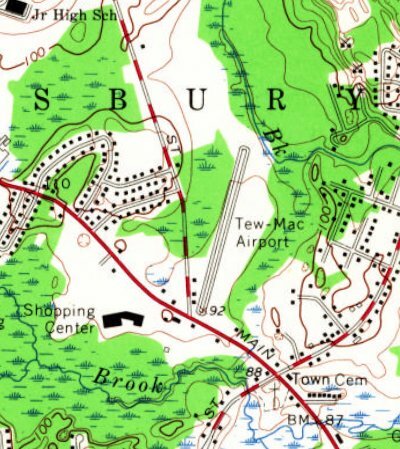 Robbins Airport was no longer depicted at all on the 1977 USGS topo map. According to Earlene Robbins Goodwin, “My father was Earle Robbins. In 1977 Thomas Decoff purchased all the land, except the 15 Collins Street house & immediate property, once belonging to Earle Robbins. This was my childhood home from 1947-63. 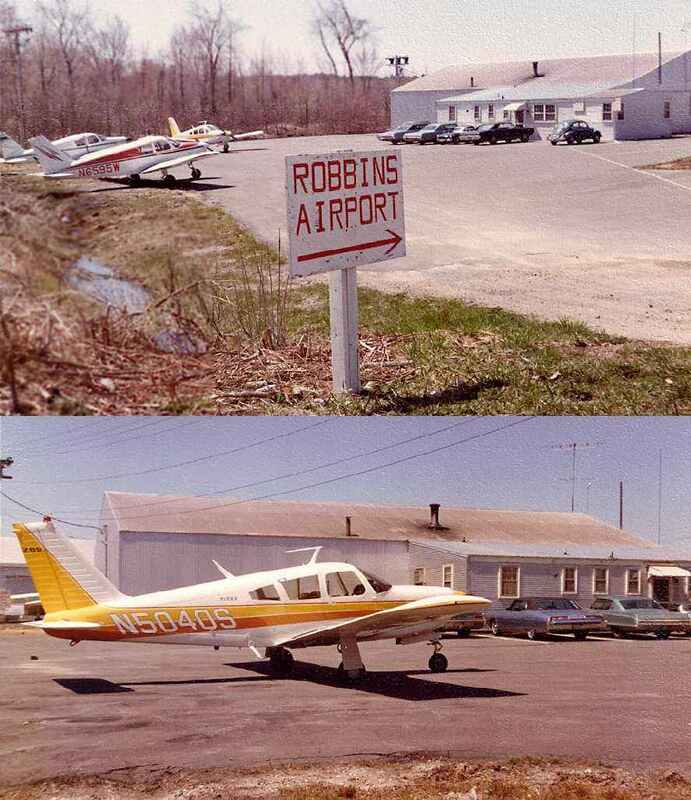 In 1977 it was Robbins Airport, but was no longer in operation. 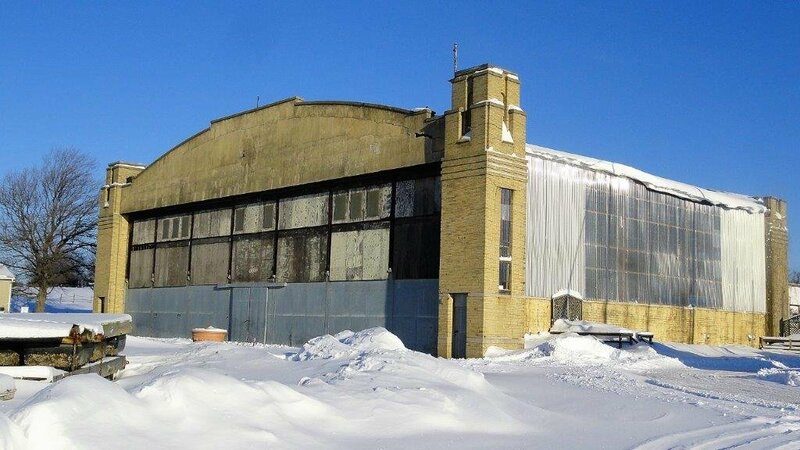 Earle Robbins passed in 1978.
but no aircraft were visible on the field, and the western-most hangar had been replaced by a large building (presumably not airport-related). Robbins Airport was no longer depicted on the June 1981 Boston Terminal Aeronautical Chart (courtesy of Ron Plante). It was described as having a single 1,500' asphalt Runway 10/28. which had been constructed on the south side of the former airport property. The remainder of the length of the runway was otherwise intact. leaving only a single hangar on the southeast side of the field. looking west at the site of Robbins Airport, with the remains of the former paved runway still intact. A single hangar still remained standing, at the bottom-left of the photo. An April 2005 aerial photo by John Ford of Les Vants Aerial Photos looking west at the site of Robbins Airport. had covered the eastern end of the former runway at some point between 1999-2005. The remains of the western half of the former runway were still visible at the top of the photo. 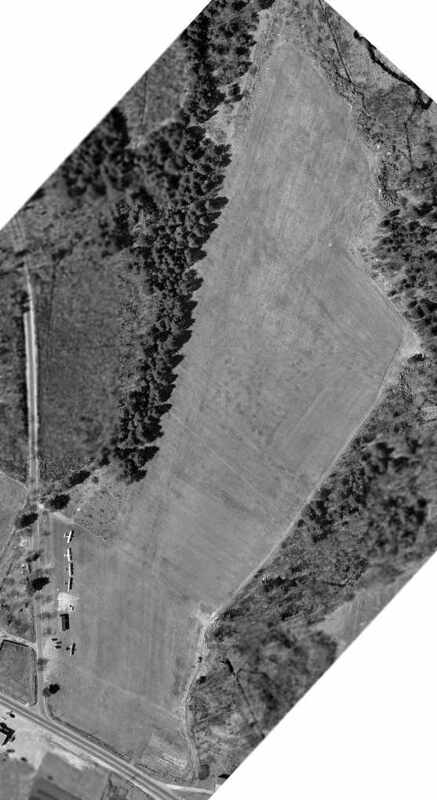 A 2016 aerial view showed the remains of the western half of the runway were the sole remaining trace of Robbins Airport. 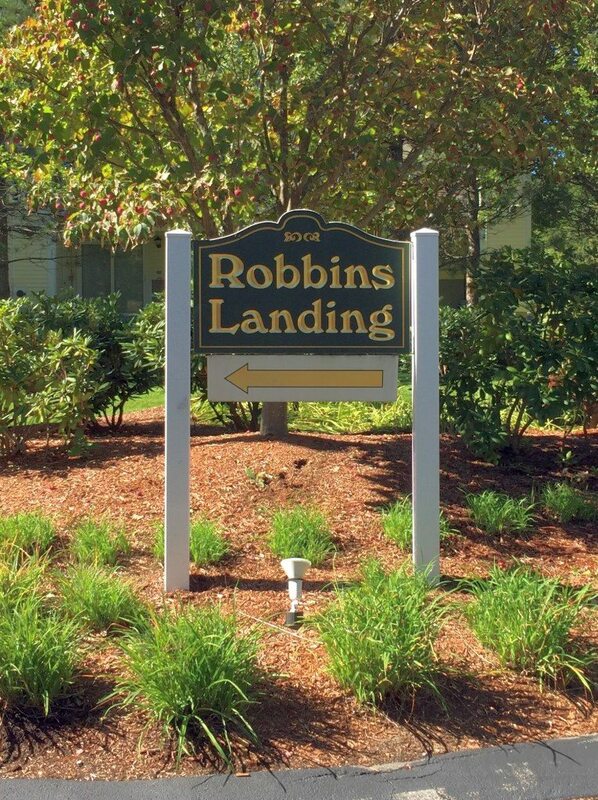 A 10/6/16 photo by Earlene Robbins Goodwin of the Robbins Landing sign on the site of Robbins Airport. A 10/6/16 photo by Earlene Robbins Goodwin of the site of Robbins Airport. Earlene remarked, “There is also a fitness facility near what we called the 'old' runway, which is totally overgrown, even with some large trees. The site of Robbins Airport is located south of the intersection of Collins Street & Holten Street. from the 4/23/28 issue of Aviation Magazine (courtesy of Chris Kennedy). This former general aviation airport & seaplane base was located along the southwestern bank of the Pines River. The date of construction of Muller Field is unknown. “The meandering inlet just beyond the airfield was dredged for a seaplane base, later canceled. 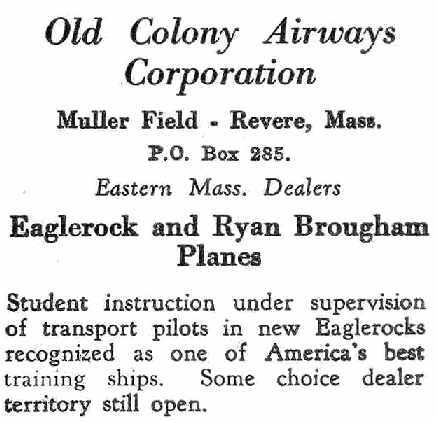 It described Muller Field as a commercial field operated by the Old Colony Airways Corporation. It was said to consist of a 1,500' x 1,000' field. described Muller Field as a private airfield, consisting of a 290 acre sod field. It was said to have 2 runways (2,500' northeast/southwest & 1,500' east/west) and 3 hangars. and the owner was listed as William Muller. since my grandfather bought land there in 1909.
described Muller as a commercial field, consisting of a 200 acre sod field. It was said to have 2 runways (2,500' northwest/southeast & 1,500' northeast/southwest). A hangar was said to be marked with “Muller Field”. and was restricted to exhibition flights at Muller Field, Revere. A biography of Julius Goldman said that he took his first flight at Muller Field in the early 1930s. The earliest aeronautical chart depiction of Mueller Field which has been located was on the 1933 Boston Sectional Chart. It depicted Muller as a commercial/municipal airport. 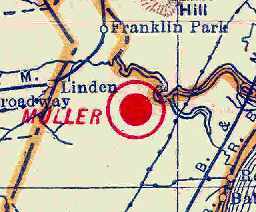 Muller Field was listed among active airfields in the 1934 Commerce Department Airfield Directory (according to Chris Kennedy). described Muller Field as a commercial airfield, consisting of a 200 acre sod field. measuring 2,500' northwest/southeast & 1,500' northeast/southwest. 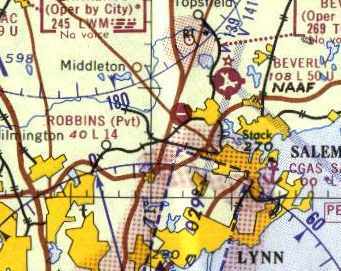 depicted Revere Airport as an irregularly-shaped field within which the longest landing distance was 1,600' north/south. Three hangars & an office building were depicted on the southwest side of the field. as that is how it was listed in The Airport Directory Company's 1938 Airport Directory (courtesy of Chris Kennedy). 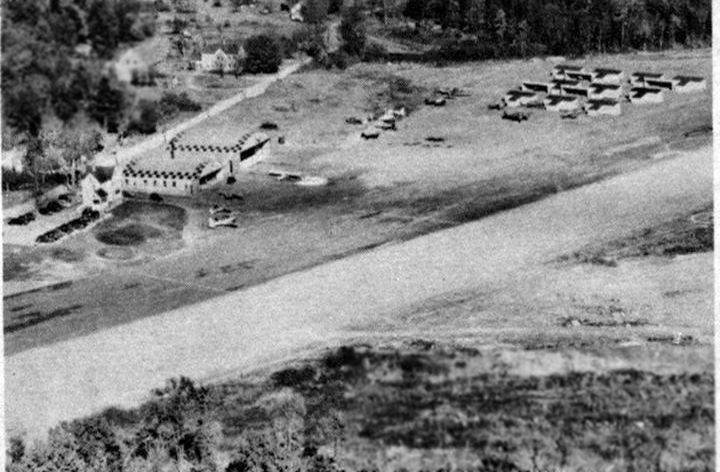 An aerial view looking northwest at the field depicted it as having a row of hangars along the southwest side. Strangely, the field was described as much smaller than only the year before – only 60 acres in size. It was said to have 2 runways, measuring 2,000' northwest/southeast & 1,200' northeast/southwest. A hangar was said to be marked with “Revere”. a row of light single-engine planes, and severla hangars, including one with “Muller Airport” painted on its roof. 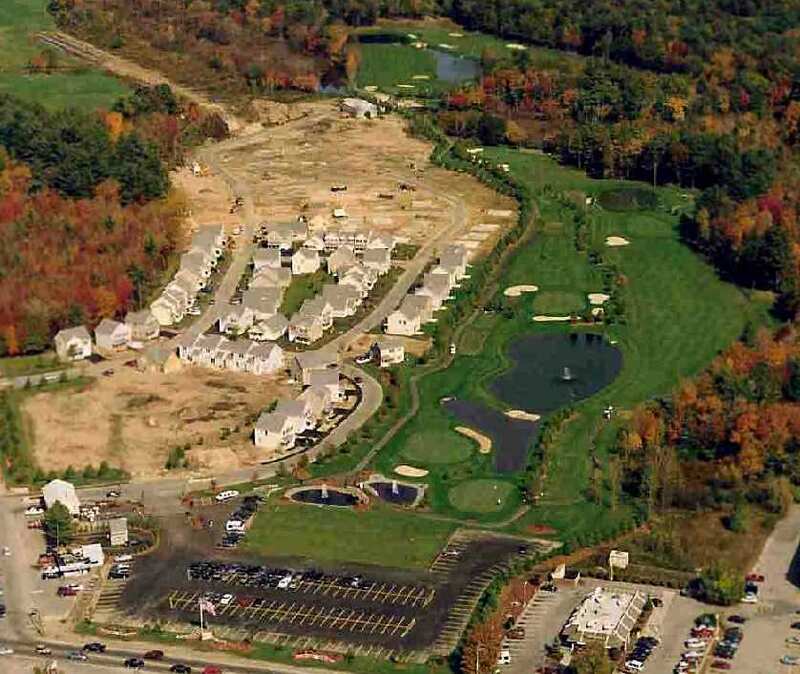 as a commercial field, consisting of an irregularly-shaped 60 acre sod property. However, the number of runways had increased to 3 – with the longest being a 2,000' north/south strip. as having several hangars on the south side of a grass airfield. The May 1941 Boston Sectional Chart (courtesy of Chris Kennedy) depicted Riverside as a commercial/municipal field. 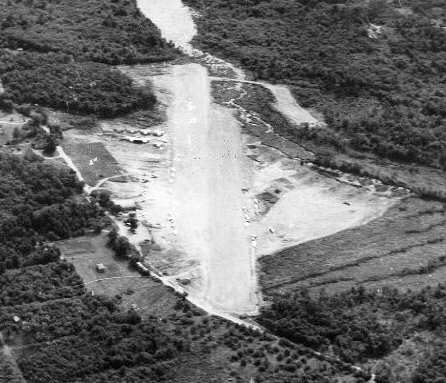 as a 10/30/42 aerial view looking north (from the MA Aeronautics Commission) was captioned “Muller Airport”. It depicted the field as having several hangars on the south side of a grass airfield, but it was devoid of aircraft. It was once again depicted as “Muller” on the November 1942 & May 1943 Boston Sectional Charts (courtesy of Chris Kennedy). nor depicted on the 1946 USGS topo map. (as was the case at many other small civilian airports, due to wartime security concerns). 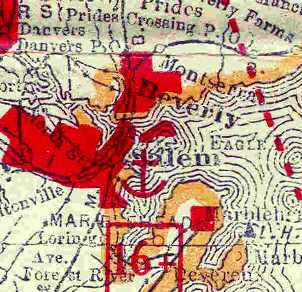 which he operated as President, general manager and chief pilot from 1946-61.
as the 1946 USGS topo map labeled the field as "Revere Airport". It depicted Revere Airport as having 3 runways (with the longest being 3,000'), with 5 hangars along the southwest side. The pond northwest of the runways was labeled as a "Seaplane Basin". in a new improved post-WW2 configuration, with 3 runways, several hangars on the south side, and several light aircraft visible. According to David Rosen, “The airport reopened after the war. 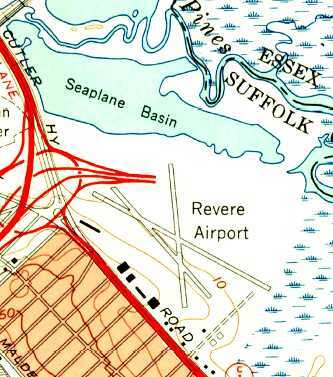 Curiousy, the 1949 Boston Local Aeronautical Chart Revere Airport misspelled the name of the airport, as “Reverse”. It was depicted as having a 2,700' paved runway. A 1949 photo by Tony Sofia of a Revere Airways Cessna T-50 Bobcat inside a Revere Airport hangar. Tony Sofia recalled, “Revere Airport... At age of 13 in 1949, I 'worked' for an ex-Navy pilot who flew banners using a Stearman PT-17. He had it modified to pick up the sign using an assembly like landing on an aircraft carrier. I assembled the banners & laid them on the edge of the main (13/31) runway. A 1949 photo by Tony Sofia of a Globe GC-1B Swift in front of a Revere Airport hangar. A 1949 photo by Tony Sofia of a Vultee BT-13 & several other light single-engine planes near the Revere Airport gas pumps, and one plane in the air. 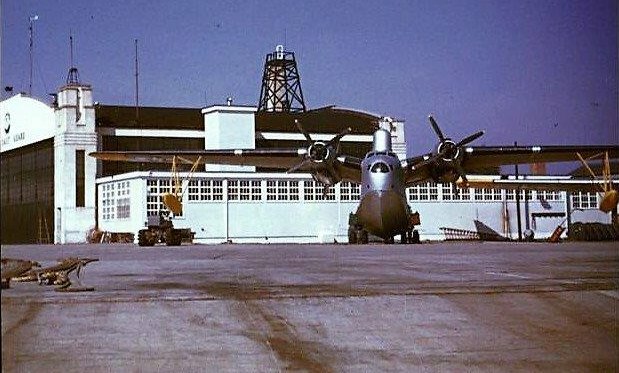 A 1949 photo by Tony Sofia of a Republic RC-3 SeaBee at Revere Airport. 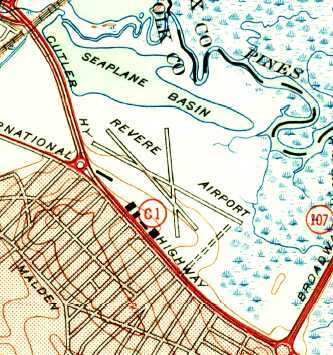 The 1950 USGS topo map depicted Revere Airport in the same fashion as the 1946 topo map. Of Revere Airport, Sal Gesamondo recalled, "It is the place I took my first airplane ride in a Piper Tri-Pacer for $2.50." my father used to take my brother & I to a small airport in Revere. I remember quite clearly being parked next to it & watching small aircraft take off & land. This would have been in the late 1940s & early 1950s." A 1950 advertisement for Revere Airport featured an undated aerial photo highlighting 3 paved runways & an adjacent Seaplane Basin. 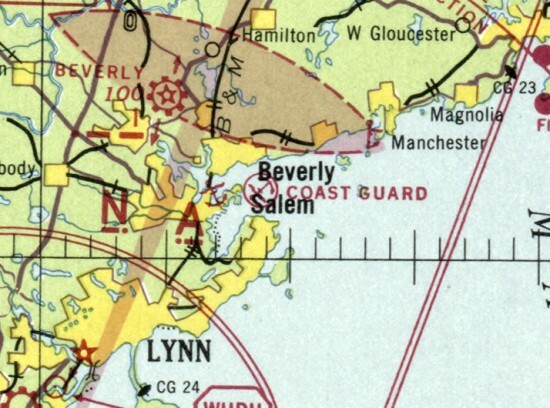 depicted Revere as having an airport & adjacent seaplane base. 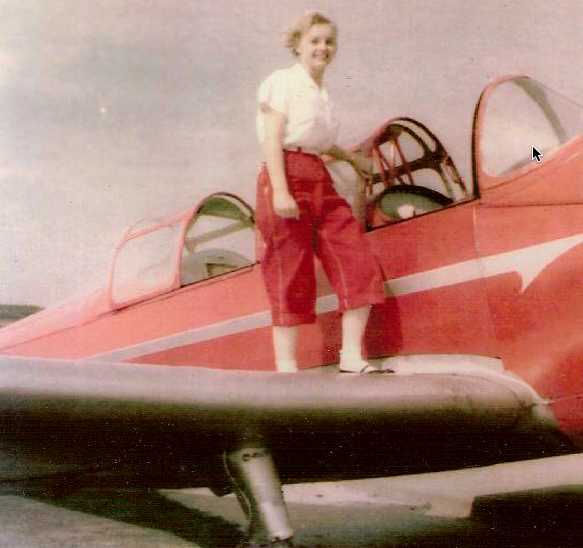 A 1953 photo of Elizabeth Haynes upon “Firebird”, her PT-23 at Revere Airport. and flew it from Bailey's Crossroads Airport [VA] to Revere Field, north of Boston. I was a lieutenant in the Air Force at the time & was attending graduate school in meteorology. I earned my private [pilot's] license there in 1953.
and a dozen single-engine aircraft visible parked outside. 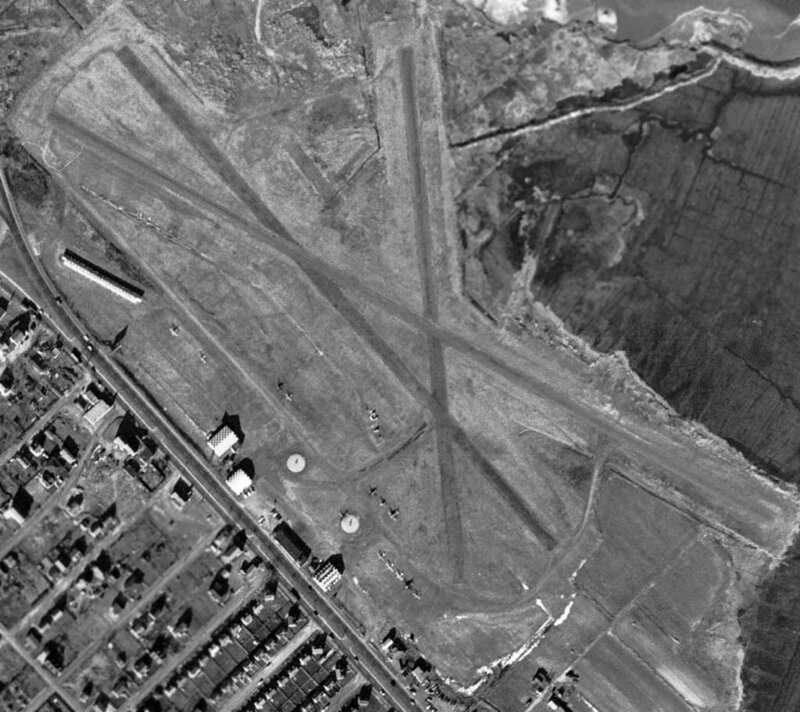 The last photo which has been located showing Revere Airport was a 1956 aerial view looking southwest (courtesy of Lou Spagnola). More than 20 light planes were still visible on the field though. perilously close to the runways. depicted Revere Airport as having 2 paved runways (2,415' Runway 13/31 & 1,740' Runway 1/19) as well as a 3rd (abandoned) runway. Taxiways led to a ramp on the southwest side of the field with several small hangars. In 1961, Revere Airways moved from Revere Airport to Beverly Airport. Revere Airport, as depicted on the November 1961 Boston Local Aeronautical Chart (courtesy of Mike Keefe). 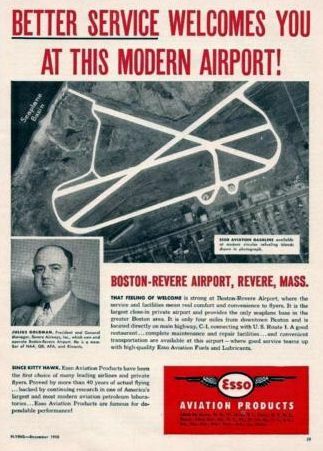 By 1962, Revere's runways had shrunken both in number & length. 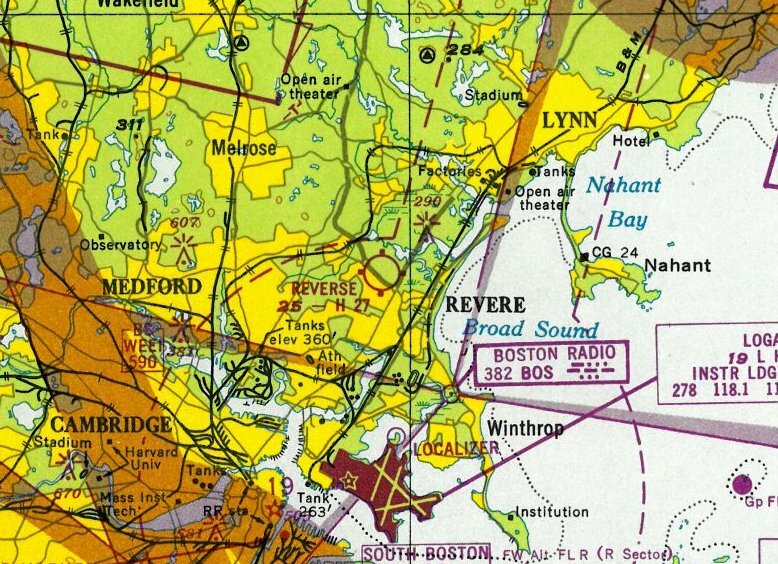 The 1962 AOPA Airport Directory described Revere as having 2 bituminous runways: 2,400' Runway 13/31 & 1,750' Runway 1/19. The operator was listed as Revere Airways Inc. 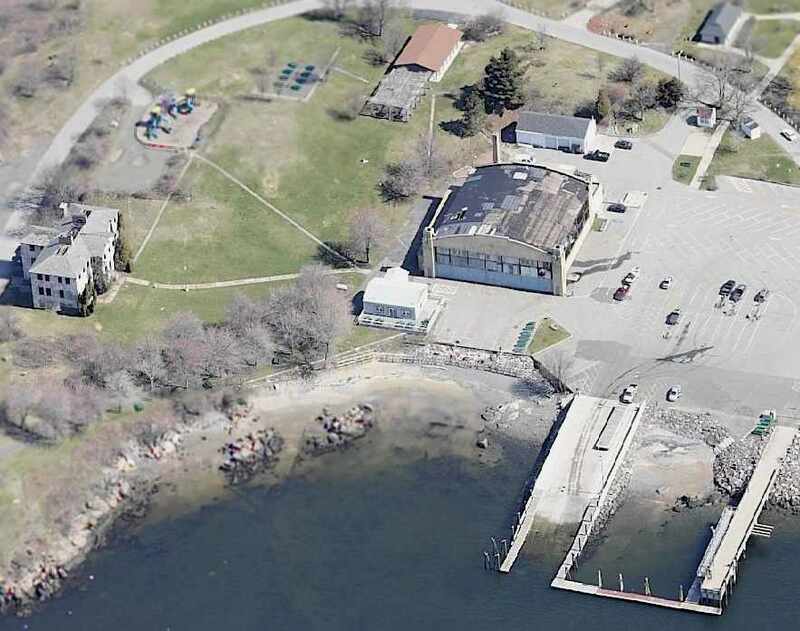 The Revere Seaplane Base was described as having a 3,300' water landing lane 13/31, but the remarks said "Emergency use only." According to a 4/24/62 Boston Globe article (courtesy of Peter Diforte), Revere Airport closed the previous day, 4/23/62. The 50 based aircraft were to be moved in a "2 day mass flyover" to Beverly Airport. Four of the "original" 11 hangars remained at closure, one of which was sold to the Orange Parachute Club. 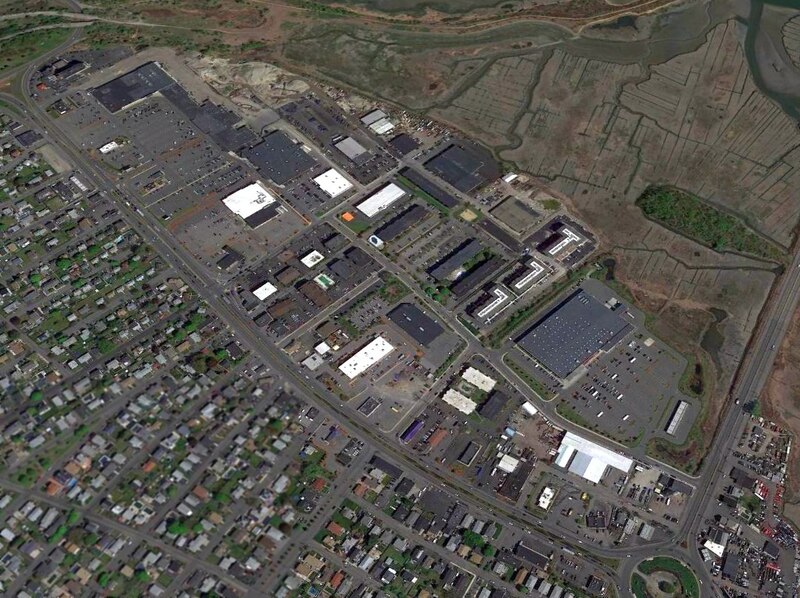 Industrial centers were eating away at the hangars, and the taxes were too high in Revere. A main reason for closure was the planned construction of the Northeast Expressway, which ironically was abandoned in the early 1970s & never constructed. 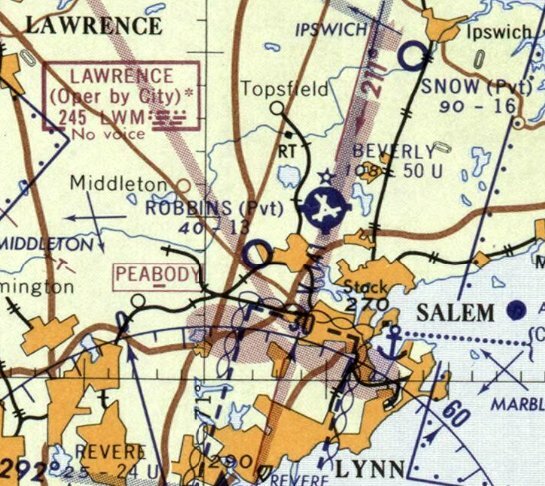 Revere Airport was not depicted at all on the December 1962 Boston Local Aeronautical Chart (courtesy of Mike Keefe). 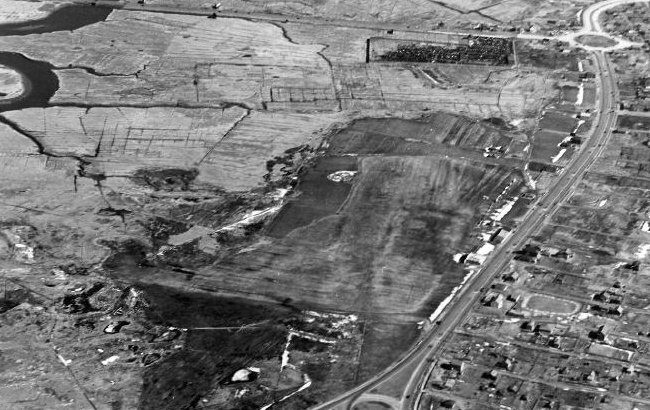 A 1969 aerial photo showed that the site of Revere Airport had been redeveloped as the Northgate Shopping Center. A circa 2006 aerial view looking east at an former hangar which remains standing on the southwestern portion of the former airport, reused as a Sozio furniture store. 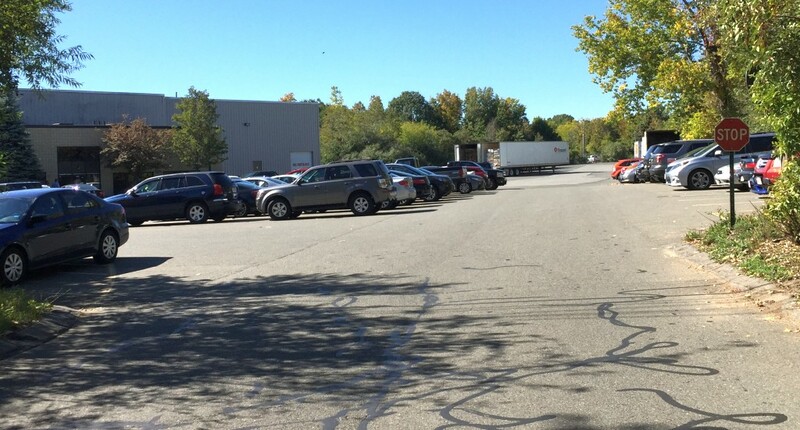 A 2015 photo of the former Revere Airport hangar, reused as a Sozio furniture store. 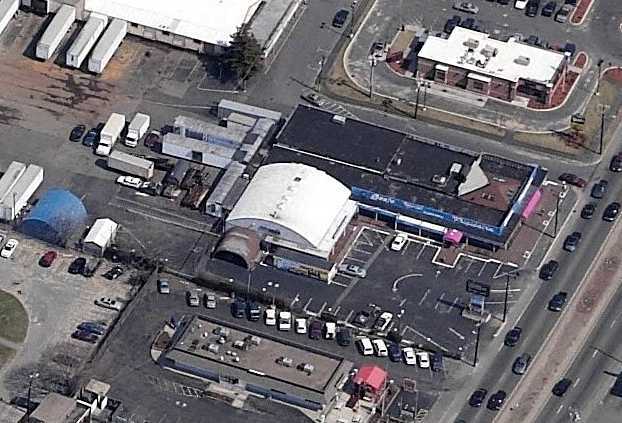 A 2016 aerial view shows the shopping center which occupies the site of Revere Airport. 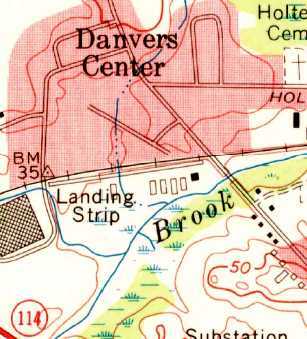 The site of Revere Airport is located northwest of the intersection of Cutler Highway & Broadway. 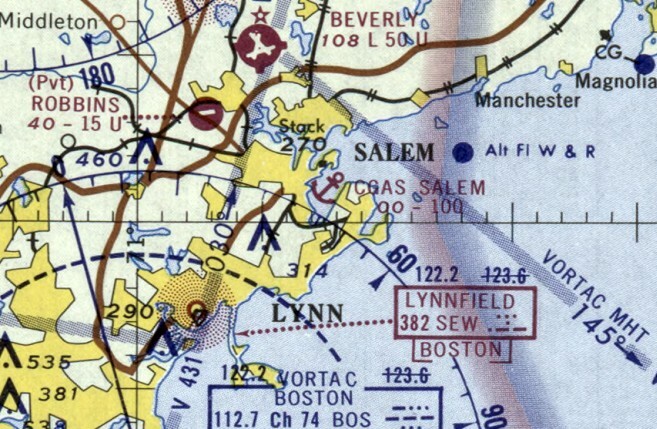 The Salem Seaplane Anchorage, as depicted on the 1929 Rand-McNally Air Trails Map of Massachusetts (courtesy of Chris Kennedy). It listed the facility as the Salem "Seaplane Anchorage", but did not describe the operator of the facility or any other details. 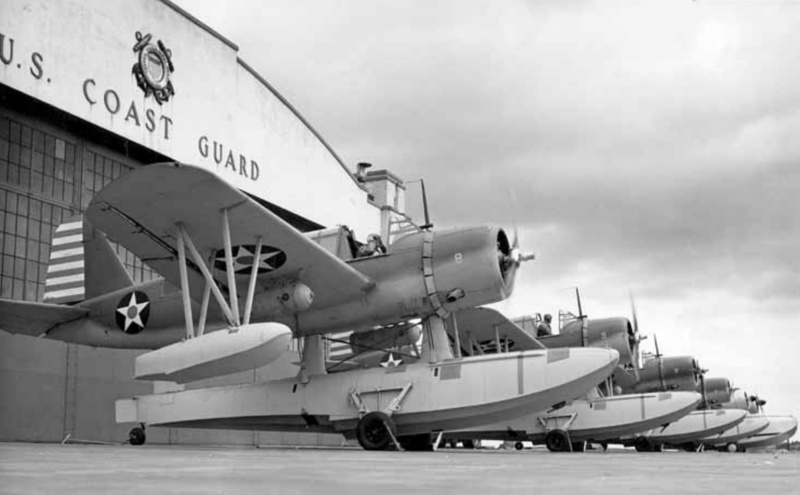 In 1935 the Coast Guard established a seaplane facility in Salem, to replace a smaller installation in Gloucester. 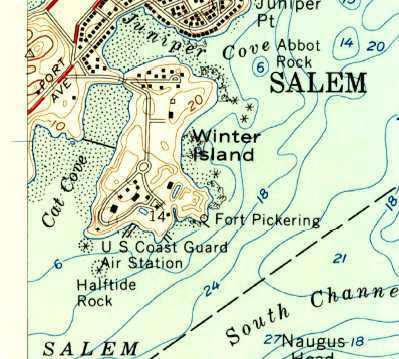 The base was located on a peninsula, Salem Neck, which juts out into Salem Harbor. being designed to handle the larger flying boats of the time. and 2 seaplane ramps leading down into the waters of Salem Harbor. according to an article in the June 2004 issue of Naval Aviation News (courtesy of John Voss). The earliest photo which has been located of CGAS Salem was a 1937 photo of a General PJ-1 flying boat inside the hangar. 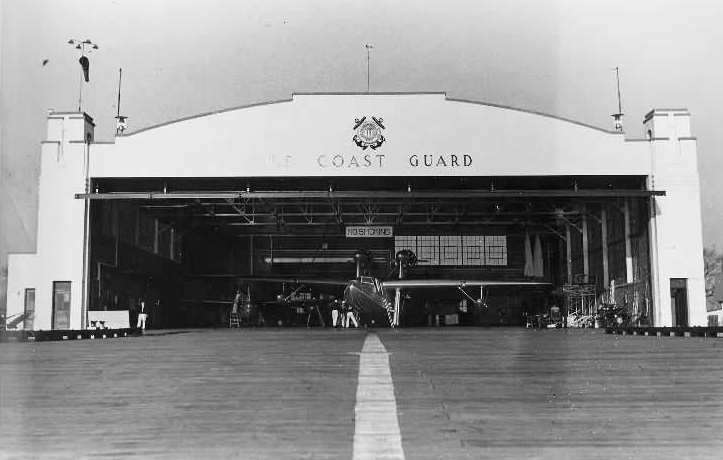 A circa 1938 photo looking northwest at Coast Guard Air Station Salem, showing a Curtiss SOC-4 Seagull on the ramp & a Fokker-General Aviation PJ-1 in the hangar. 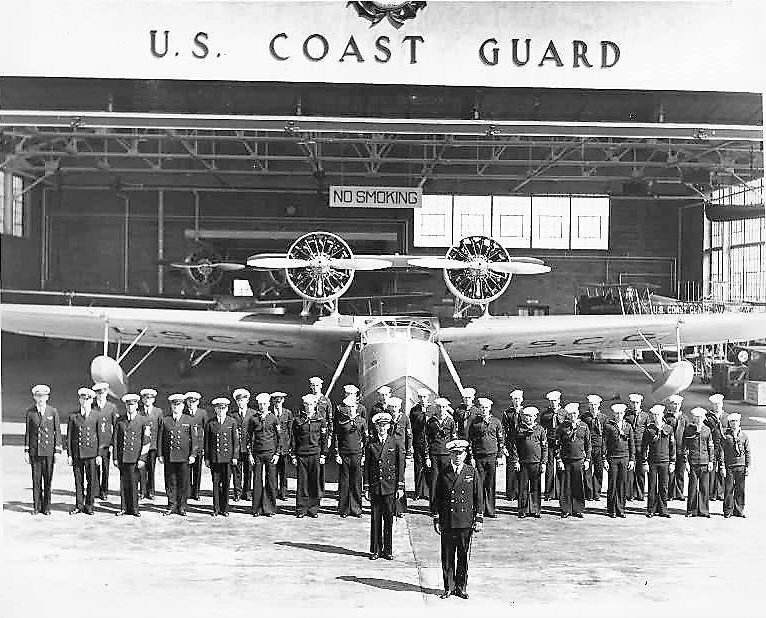 A circa 1930s photo of General Muster of personnel in front of an unidentified flying boat at Coast Guard Air Station Salem (courtesy of Ron Janard). CGAS Salem was not yet depicted on the September 1938 Boston Sectional Chart. 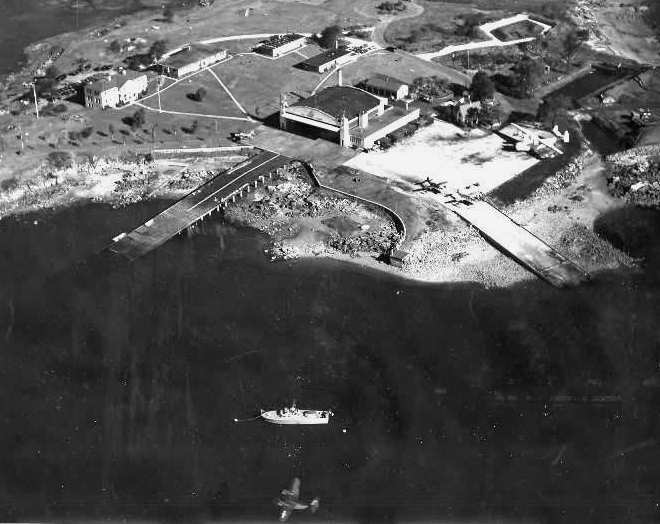 An 11/20/38 USGS aerial photo showed Salem as having a hangar & seaplane ramp. One or possibly 2 aircraft were visible on the ramp. Salem CGAS, as depicted on the May 1941 Boston Sectional Chart. In 1941 air crews from Salem began to fly neutrality patrols along the coast. making it the second largest Coast Guard station on the east coast. 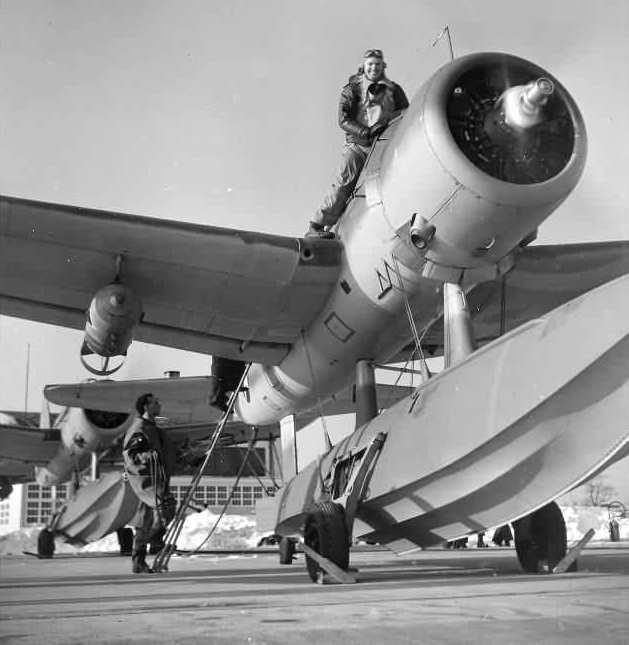 A circa pre-1943 photo of a Vought OS2U-3 Kingfisher at CGAS Salem (courtesy of Ron Janard). 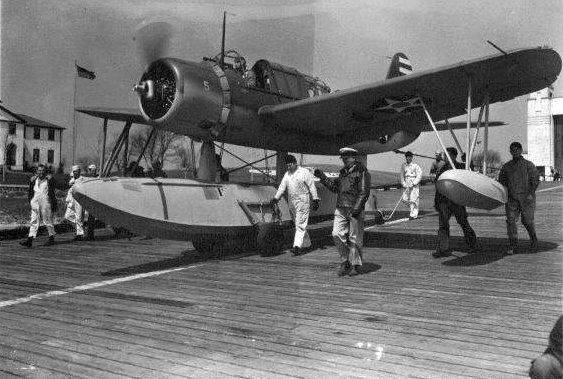 A 1943 photo of 4 Vought OS2U-3 Kingfishers assigned to antisubmarine duty at USCG Air Station Salem (USCG photo from the C.H. Hamilton collection). A 1944 photo of an OS2U-3 loaded with depth charges preparing to launch from CGAS Salem. as the first US Air-Sea Rescue service on the eastern seaboard. 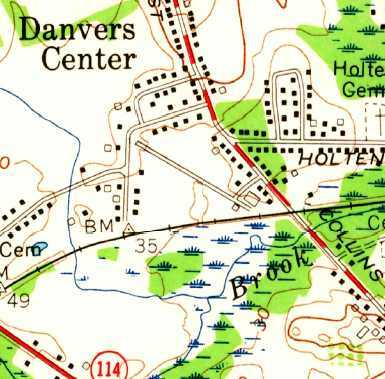 Salem CGAS was not yet depicted on the 1945 USGS topo map. with several aircraft on the ramp, and one flying by at the bottom of the photo. 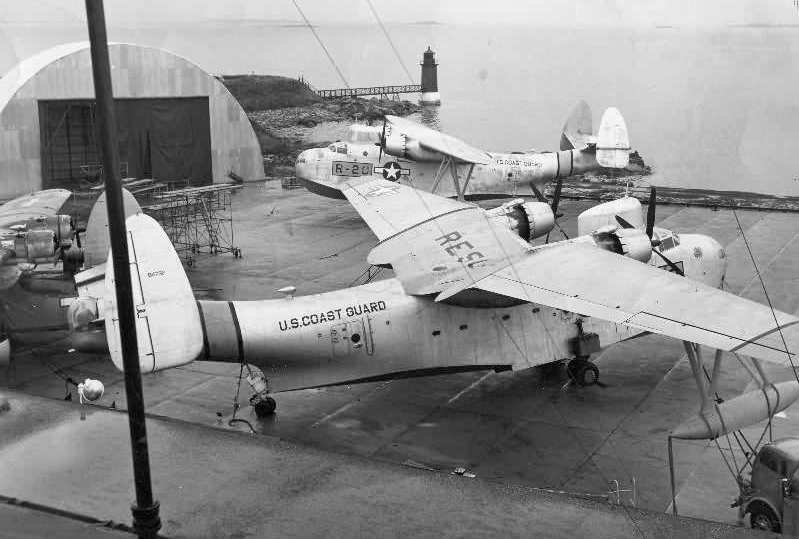 A 1945 photo of 2 PBM flying boats on the ramp at CGAS Salem. 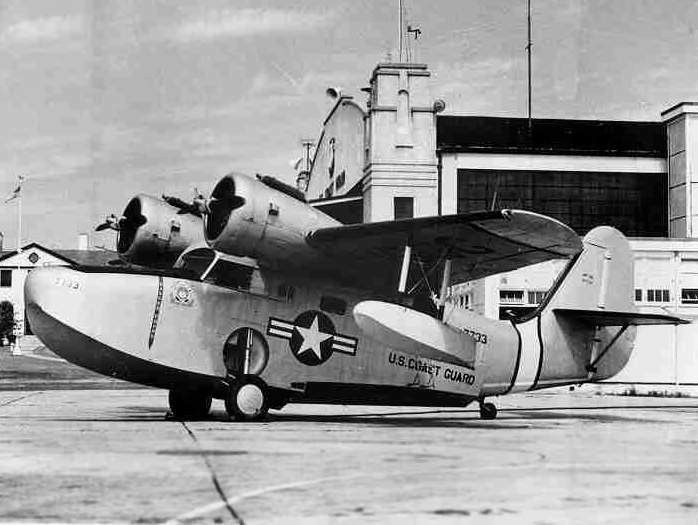 An undated view of a Grumman Goose amphibian flying boat on the ramp at Salem CGAS. 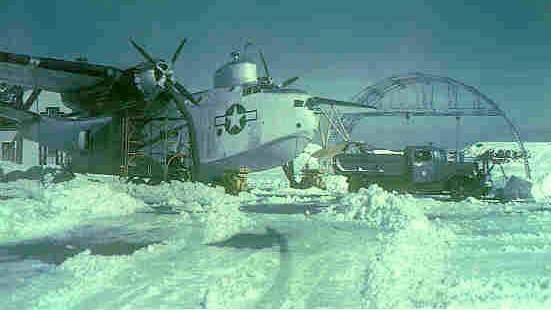 An undated view of a PBM flying boat on a snowy ramp at Salem. of helicopters, multi-engined patrol planes, and flying boats. 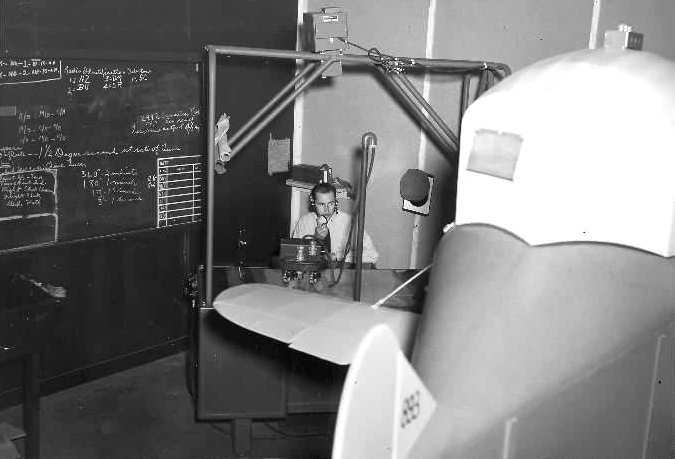 at the instructor station of a Link Trainer (an early flight simulator) at CGAS Salem. 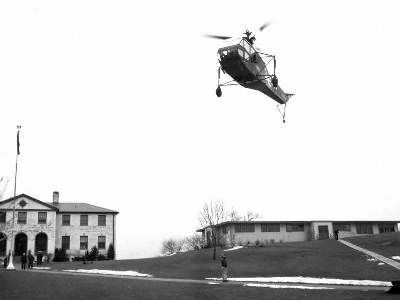 A circa 1952 demonstration of a Sikorsky HNS-1 helicopter at CGAS Salem. A circa 1950s photo looking west at a Martin PBM Mariner flying boats in front of CGAS Salem's hangar (courtesy of Ron Janard). and at least one other flying boat on the apron. A 1955 aerial view looking northwest at CGAS Salem showing 2 helicopters & 2 flying boats on the ramp. The 1956 USGS topo map depicted “U.S. Coast Guard Air Station”. 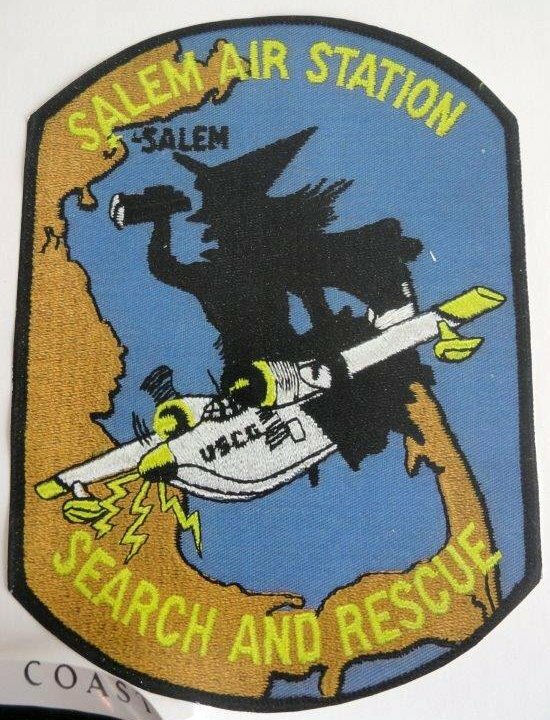 An undated patch of Salem Air Station Search & Rescue (courtesy of Ron Janard). A circa 1960s aerial view looking north at a Gruman HU-16 Albatross overflying Coast Guard Air Station Salem (courtesy of Ron Janard). 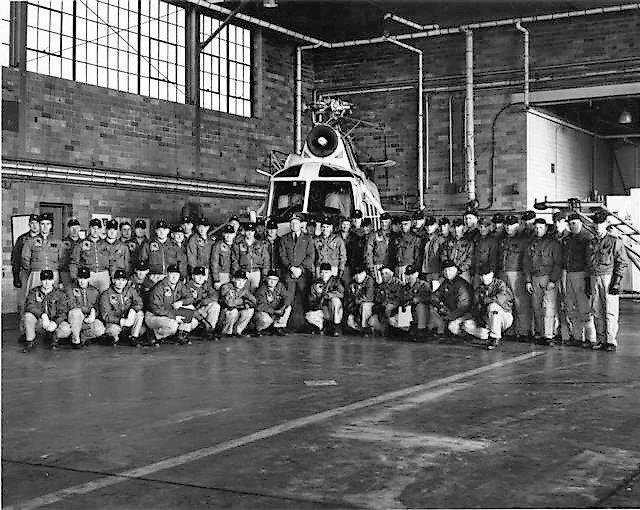 A circa 1960s photo of Coast Gaurd personnel & a Sikorsky HH-52A Seaguard inside the CGAS Salem hangar (courtesy of Ron Janard). showing a Sikorsky HH-52A Seaguard overflying a Grumman HU-16 Albatross. showing a Sikorsky HH-52A Seaguard & a Grumman HU-16 Albatross. An undated (circa late 1960s?) 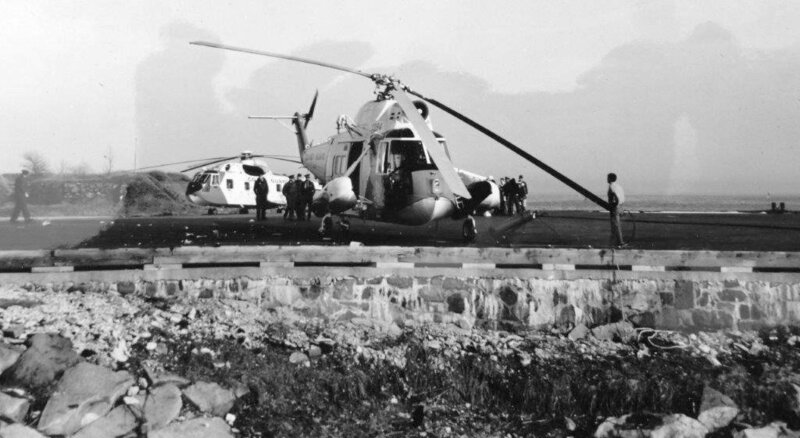 photo of a Sikorsky HH-3F Pelican & a damaged Sikorsky HH-5A Seaguard at CGAS Salem (courtesy of Ron Janard). which showed 2 flying boats on the ramp. 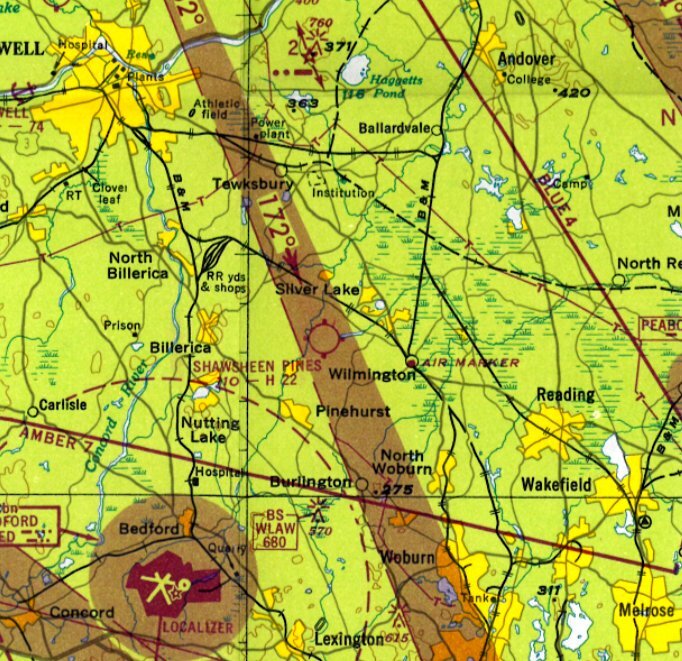 The last aeronautical chart depiction which has been located of CGAS Salem was on the March 1970 Boston Sectional Chart. the Coast Guard eventually began to search for a replacement facility for Massachusetts area flight operations. 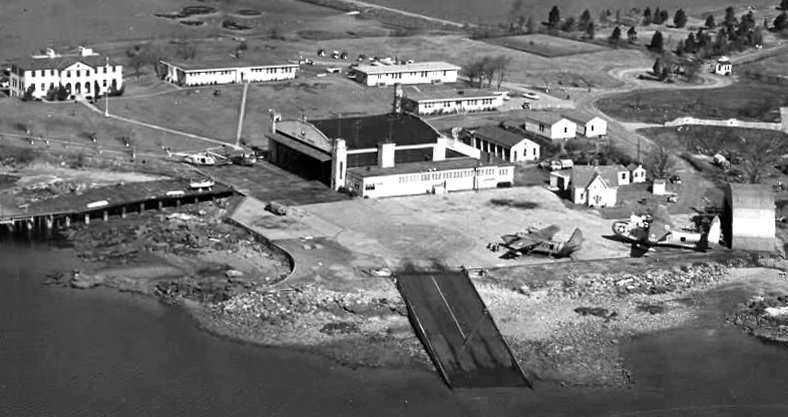 Salem CGAS was closed in 1970, and Coast Guard operations were moved to Otis Field. 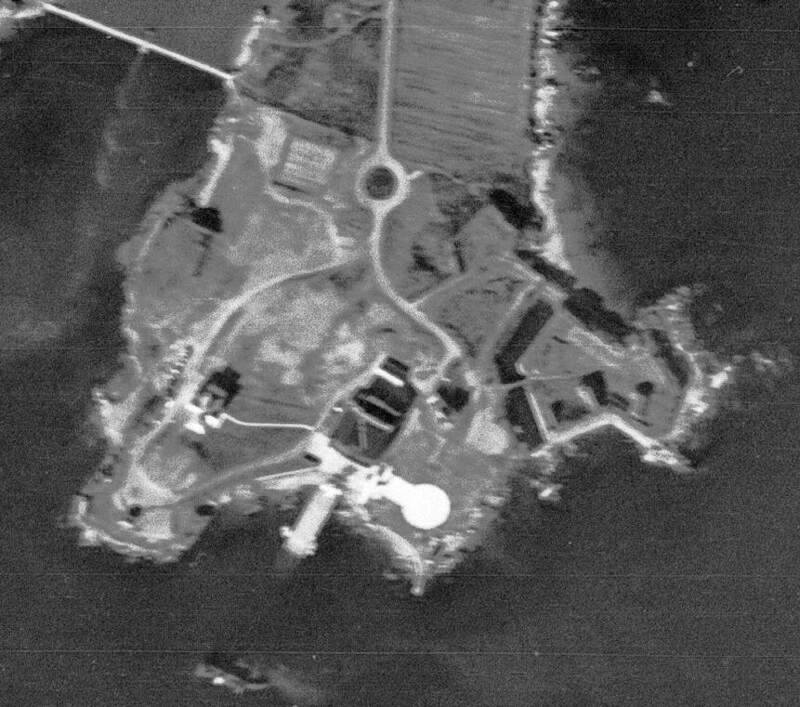 A 1971 aerial view of CGAS Salem, only a year after it was closed. 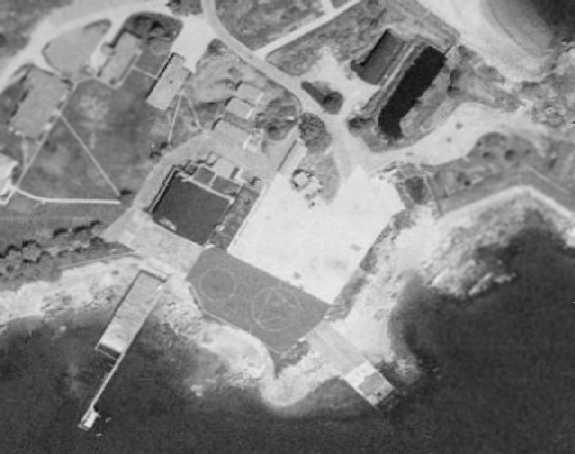 The ramp had 2 helipad circles painted on it at some point between 1969-71.
but the facilities of the former Coast Guard Air Station were allowed to slowly deteriorate. but this was not carried out. As of 2003, the property of the former Salem CGAS is reused as the Winter Island Marine Park. and motor pool building remained standing, but in poor condition. An organization called Historic Salem Inc. is attempting to ensure that the property will be preserved. 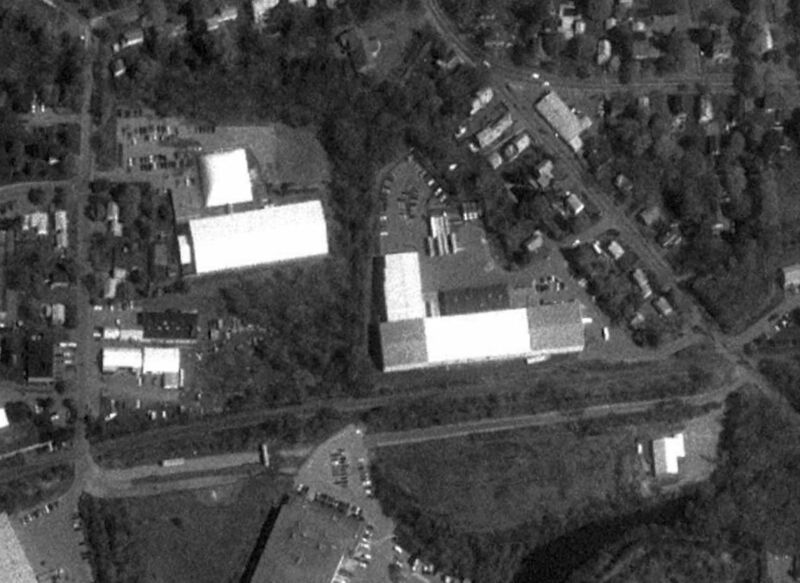 A circa 2005 aerial view looking north at the former Salem Headquarters building, hangar, and ramp. 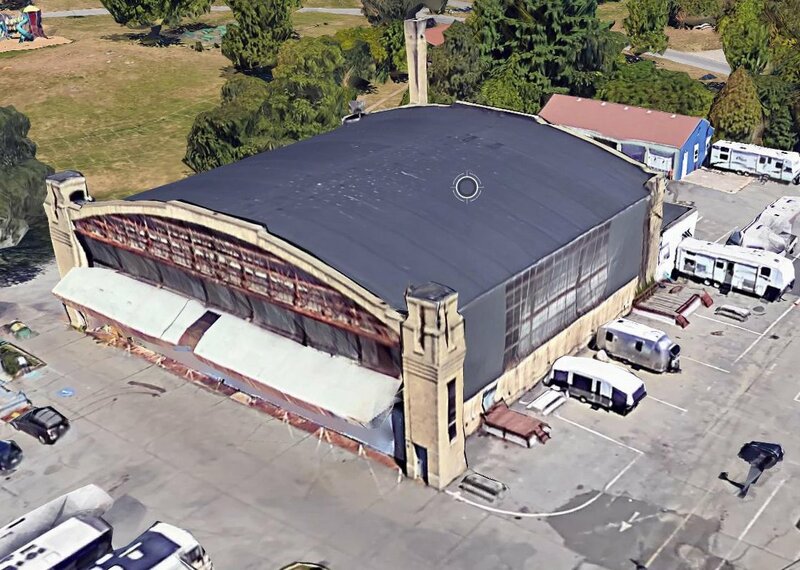 A circa 2010-2017 3-D aerial view show of the former CGAS Salem seaplane hangar. A 2011 photo by Ron Janard looking northwest at the former CGAS Salem hangar. 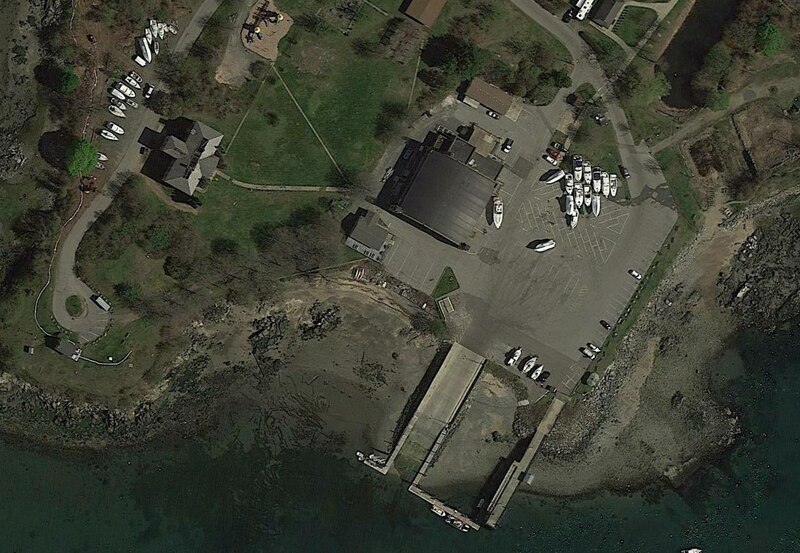 A 2016 aerial view show the CGAS Salem seaplane facilities to remain intact.